A Reasoned Landscape | .............Your Journey Begins. You can make Winter shorter. The earliest flowering things of Zone 5B can grant this wish. You can count on certain early plants absolutely…in all the categories of scale. There are ground plants, shrubs and trees that come so very early. 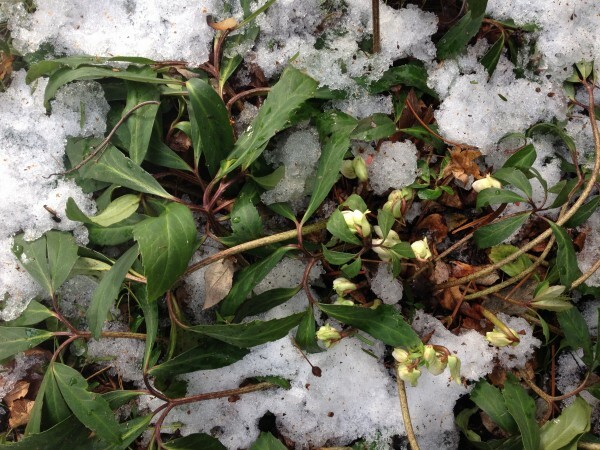 Just as the snow recedes, they flower, and we are encouraged in the impression that the winter is ending. If you plant the naturally early ones in places where the snow first melts, they will be as early as early can be. While some some of these harbingers of spring are well known, others, although entirely dependable and exceptionally good plants, are rarely seen. Each of these kinds of early plants is precious and I wouldn’t want you to miss knowing about any of them. Favorite Early plants you may not have met. Many of us are subject to this predilection. 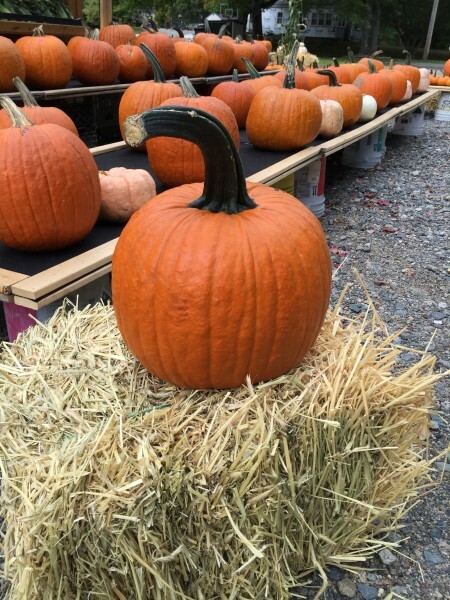 Garden Centers and small Nurseries know that whatever is in flower is most appealing to the customers, so they tend to bring in plants that flower later in the year, when people are more likely to be there shopping. For this reason, finding things that will flower very early in your garden can be tricky. Some kinds of early flowering plants you may not have met yet can be just as reliable and welcome as the varieties more typically planted. Knowing the names of some uncommon early plants can help you to find some of them for your future. Once you get some of the rarer but recommended ones into your grounds, they will return to greet you every year. Many will multiply along over time, making it worthwhile for you to have gathered some of these good parents to get things going. For the less common but wonderful earliest plants, you will perhaps need to find sources on line, aren’t we lucky that we can do that. It used to be much harder to find the unusuals. Years of looking even….. These are some of my favorite kinds, and each has proved as reliable as spring itself. This ultra hardy group of perennials includes some kinds that flower at Christmas time, and various other cultivars can appear in sequence through the early months of the year, some with their flowers still looking good in late May. Their foliage is evergreen, and that helps us get through winter too. For information about Hellebores, please click here for my recent article about them. Among the familiar earliest bulbs are Snowdrops, Crocus and Squills, but each of these kinds may be found in multiple forms. If you look around, you may find varieties of them with diverse color or stature. Adding multiple colors of a kind of plant is often enhancing to the appearance of the colony. You might even like alternatives better than common forms. 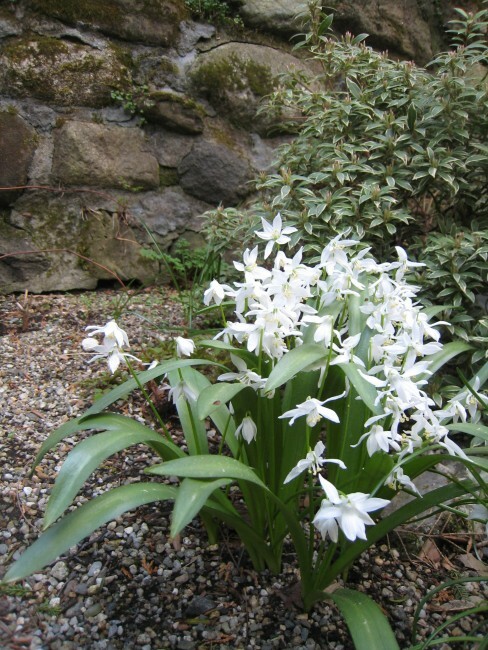 Most bulbs are best acquired in fall by mail order, but are fine as a direct garden transplants in spring if you have an endowed garden friend or neighbor. This little species Crocus is an early bloomer, up with the first flowering things and willing to propagate along, so this is a great one for colonising. Since it is smaller in size and finer in foliage than the more usual Dutch Crocus, C. tommasinianus often seems a better choice. Less messy after flowering, perhaps more native in feeling than the larger kinds. Their typical color is a good lavender, but there are other forms of tommasinianus with various tints and shades of the species amethyst color. Having some variants of color sprinkled in gives the colony a shimmering quality. If you plant them a few feet back in the perennial beds instead of in the front, after they decorate bare ground in March, they can soon be covered by the oncoming leaves of other things. I tend to keep these crocus away from true blue squills, whose bright blue diminishes their subtle lavender. 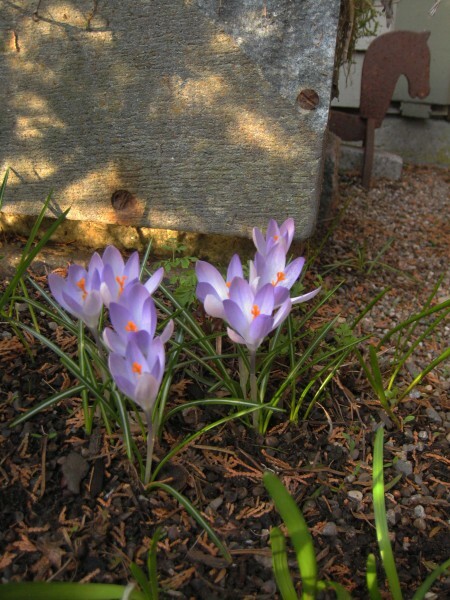 The crocus is loveliest when it is paired instead with other jewel toned spring colors, or yellows and whites. The lovely white to pale blue bulb pictured below is Pushkinia libanotica. It is very willing and prolific. These and the true blue Siberian squills in the next picture do not mind driveways or roadway edges, salt and all, and multiply along. These are strong bulbs. Both are happy, for instance, to occupy the same ground as Corydalis lutea, a perennial who will, from May to November, cover those same difficult places with graceful, soft yellow flowers. There is also an ivory form (Corydalis lutea alba) who flowers nearly that long too. The blue siberian squills are tough enough to colonise even in the midst of Phalaris albopicta, the ribbon grass, and both are good roadside plants. The grasses cover the passing foliage of the bulbs. The white version of Scilla sibirica is lovely and useful too, though it may arrive a bit later. 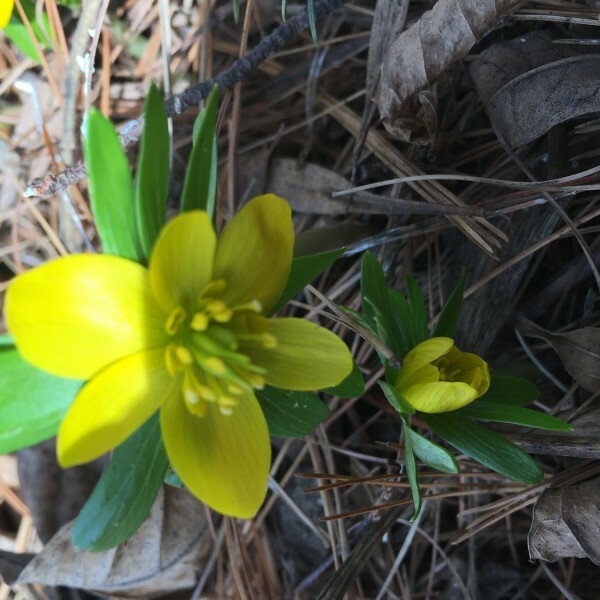 Around here, the Eranthis hyemalis provide sunshine yellow flowers in March, often earlier than even the squills. In the photo below, theirs is the incised foliage between the blue Squills. Though the flowers have finished already, you can see how many there were since each early leaf carries its own flower. Eranthis multiply slowly at first, so try to start off with quite a few individuals. If they come to you dry, soak them. Better to find fresh local ones if you can find a willing sharer with an old colony. Squills redecorate the Aconite leaves. Even after flowering, the Aconites spiral foliage stays nice a long while. trimmed when it loses its green freshness. 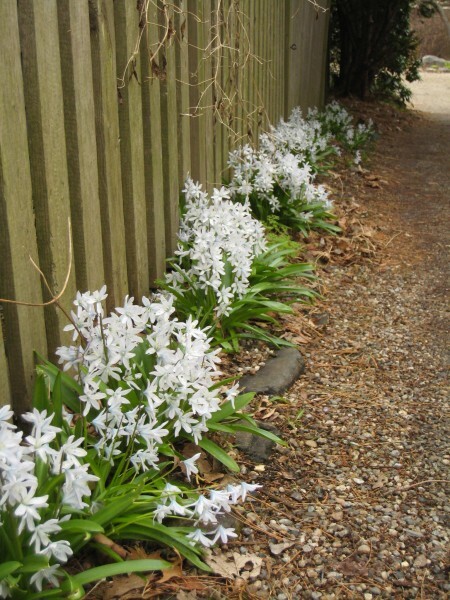 Chinodoxa’s white or lavender-blue and white forms light up old properties, the spreading colonies quiet testimony to the number of years the place has been gardened and noticeably loved. Be glad if you can have some but beware of their fast multiplying character with lots of foliage to deal with afterwards. You will want some plants amongst the bulbs whose fresh enlarging leaves will help to cover the messy foliage, with maybe some shearing on your part. If you want multiplication, shear after the seeds mature and self sow. In the picture above they are distributed in the grass areas also and are mowed, but sometimes after they go to seed it would appear. Scilla sibirica is fine with mowing too but visible for a while in the lawn. The first Corydalines to arrive each year are the bulbous types. These grace early April and are reliable, here reappearing in the same place for more than 30 years, with each colony enlarging little by little. There are a few subtly different color forms. 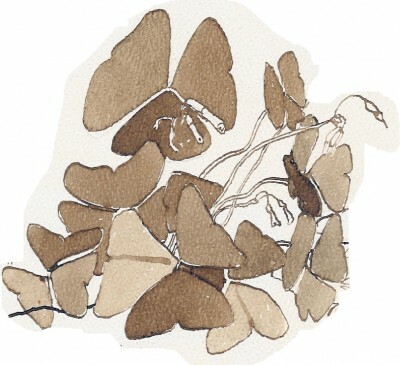 These are not the long blooming corydalines, but their early appearance makes them treasures. Their habit is that soon after flowering their foliage melts quickly into the ground. 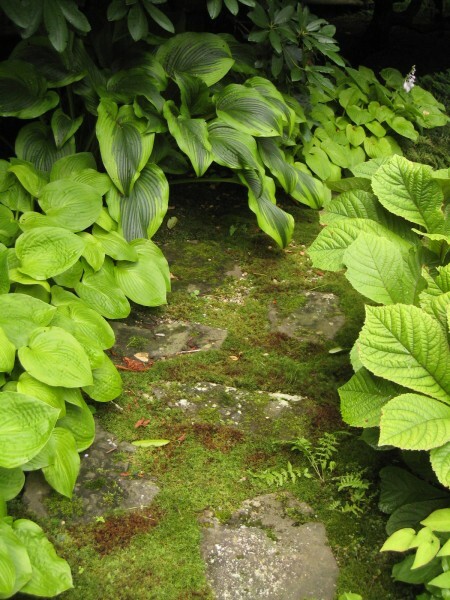 For ornamental garden purposes, it is perhaps best to nestle them amid some neat, shallow rooted groundcover who fills in to discreetly and covers them as they go by. Sweet Woodruff, Asperula odorata, can do a great job in the ‘up and over’ department. The Woodruff also flowers beautifully in the same place a little bit later. Phlox stolonifera and Vinca Jekyll’s white are also favored as slightly later flowering overplantings for areas with small early bulbs. Okay, okay, these are leaves not flowers….but unless the snow covers them up the leaves can be cut for every flower arrangement from November straight through the winter and on into the next early summer. This Arum is therefor beautiful in the landscape from the earliest days of the year. And, somehow, each and every leaf is perfect. Since the leaves stay impeccable under snow, the day it melts, there they are, and so I include A. italicum pictum here to help you shorten your winters. 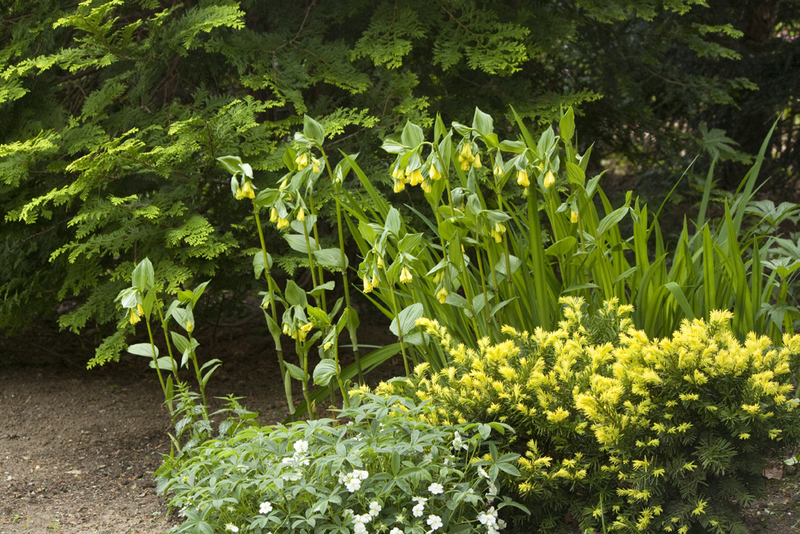 Also called Fairy Bells, these Disporum arch gracefully at 2 to 3′ with yellow flowers in April. They don’t mind quite a bit of shade later in the season, and so can live happily in a woodland margin or under deciduous trees. Being early, they are ideal for the midground or back of beds, behind perennials that fill out a bit later. The first arrival here is Saxifraga apiculata. These are nearly evergreen and just tiny, but now they have presence as spring heralds with their pale yellow flowers. I keep them in troughs. Draba siberica is among the first things to flower in the rock garden, bright as butter. If you plant a Vitaliana near Draba, a week or two later this plant will provide the bright yellow after Draba goes by, doubling the flowering time at that scale in the rock garden. 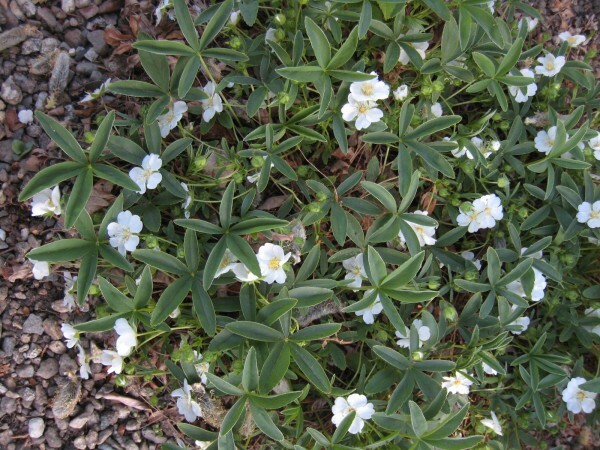 By mid April this alpine Potentilla is covered with leaves and white flowers. This habit may be a result of its place of origin, because with the short warm season of the mountains, it is a good strategy for the plants to get off to an early start. While lovely in a rock garden. This tough but beautiful plant has enough substance to be grown at the edge of an open perennial garden. Its size and quality of appearance through the garden year make it a very satisfying front row plant. The evergreen Pieris japonica and cultivars provide buds that look like flowers all winter. In earliest spring their open flowers in white or pinkish tones are enhancing to everything around them. Great in views with small early bulbs. The pink one is P.Valley valentine. In February we can welcome flowers on the Witchhazels (Hamamelis), then when the twigs of grand old Weeping Willows glow yellow against blue sky, it signifies the beginning of the unfolding of spring. The Pussywillows (in variety) provide branches of downy cottontails sometime in March. Although these are not flowers but catkins, they often provide the first bouquets of the year for the house. 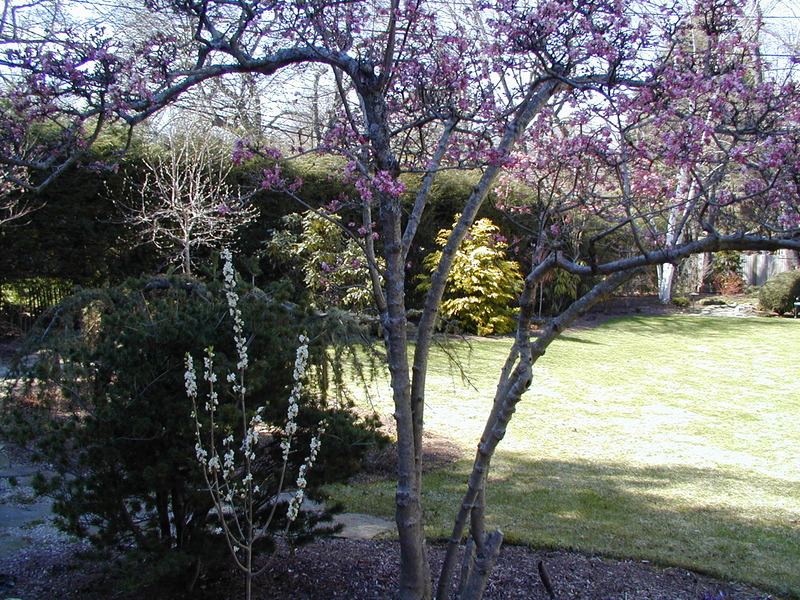 The cuttings shown below are from an 80 year old Salix discolor, an American Pussywillow. Once cut, the branches can stay in vases without water and look great for a year or until you are tired of them. Some Pussywillows are shrubby, but this one becomes a very large tree. Before planting any pussywillows, I would do alot of reading and looking at mature ones though, as they tend to take up alot of space, make for alot of pruning work and drink alot of water. But what a Harvest, plenty to share. It might be a good shade tree for a Community Landscape, especially there was an overabundance of ground water. We find Willows in general residing in places with a high water table. They have always been helpful in keeping the water level lower where people want to use the land. 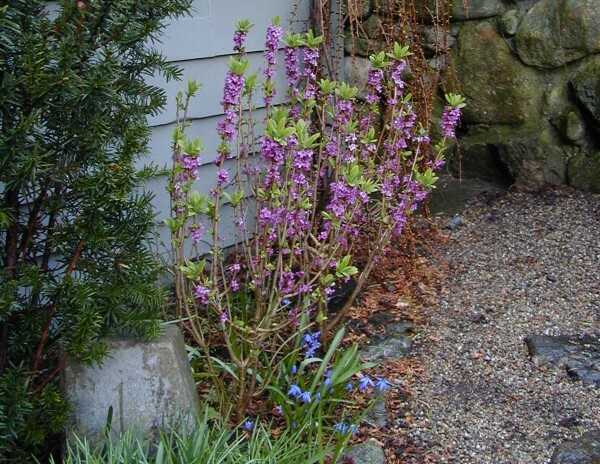 Daphne mezereum, on the other hand, is wonderfully easy and early shrub to have. 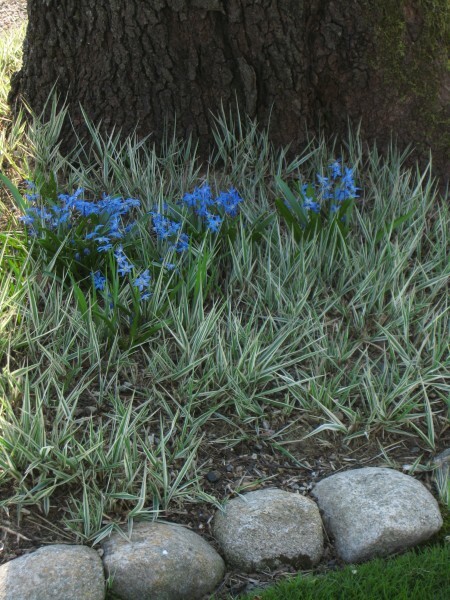 (Shown with Scilla siberica below). The white form of Daphne mezereum is early and reliable also, and makes a nice companion for the beautiful lavender Viburnum bodnantense shown here, which is one of the first of the tree forms to flower hereabouts. 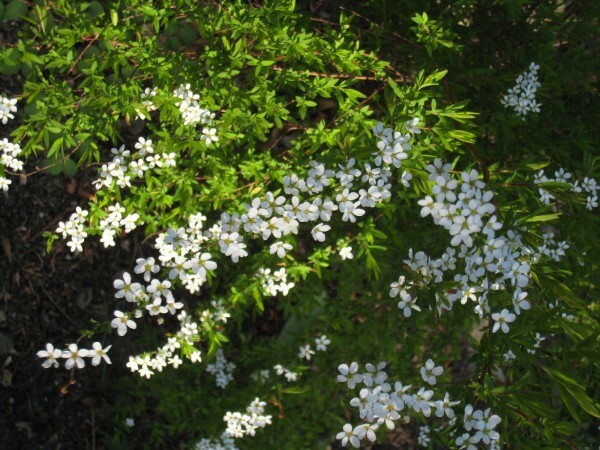 The very early white Spirea thunbergii flowers before most things leaf out, and this plant doesn’t mind living in the partial shade that comes afterwards in a garden or woodland setting with deciduous trees. Its fine and feathery foliage remains freshly lovely throughout the garden season. 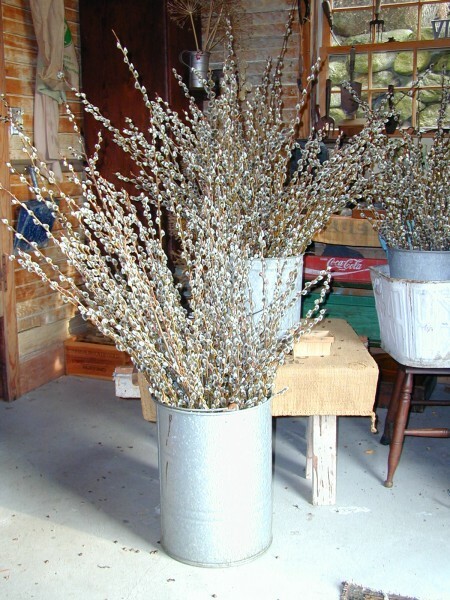 As with Forsythia, you can bring in cut stems before flowering time, and then soon have indoor flowering in your vase. S. thunbergii was once a very popular garden shrub, but nearly disappeared from the trade, out of style it seems, batched with ‘old fashioned’ plants. Being beautiful and easy to please, these should not be forgotten. You may need to locate them from a specialty nursery via an internet search. They root very easily. In the very early shrub department there are also quite alot of Azaleas, and of course I don’t know all of them, but among the very best I have found are Azalea Mrs John Withington, Azalea Hally Jolivette and Azaleas Westons pink diamond, A.Aglo and A.Olga. For a chart of the typical flowering times of various Azaleas and Rhododendrons, click this link to an article from Weston Nurseries. Early Friends for next year among these favorites. what you really need is a Wizard. This Wizard is a Rake. In some ways, just after snow melt is a very good time to work in the landscape. The plants have not yet sent up many greens, so it would appear that one could make quick work of the winter twigs and general bed cleaning. The problem is, with how moist everything may be, even walking around needs to be light footed. For the tender things just emerging from under the earths surface, the only safe way to clean is with gentle hands. The good news is that having a Wizard or Merlin rake is pretty much like having a gentle hand with a great many fingers on a very long arm. Their rubber tines can run along surfaces, barely disturbing the plants or the earth below. With their help, you can accomplish your early cleaning goals without nearly as much bending over or kneeling as hand work requires. Not quite as amazing as a flying broom, but for a gardener, somewhat magical. Early in the year in our zone 5b and many other northern ecotomes, normal rakes are typically out of the question because any plants that are just about to emerge and unfurl their leaves are easily harmed. With some kinds of plants, those first leaves last much of the year. If you slice into them, you run the risk of somewhat spoiling their appearance for a long while. Another problem with the metal rakes is that shallow rooted plants, seedlings and seeds may be dislodged just as they are trying to root. In early spring in our ecotome the ground is moist, so even grass can get ripped up easily. 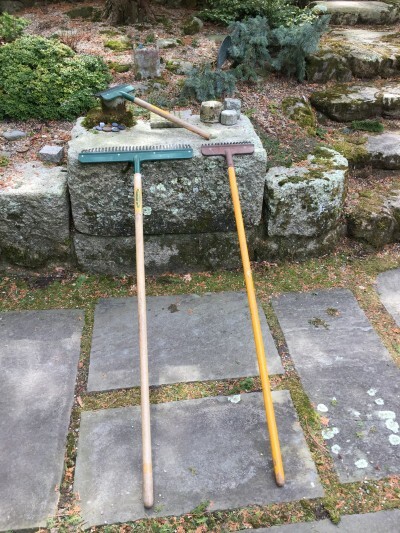 Whereas normal metal leaf rakes have to wait for some more drying out of the earth, you can get a jump start on the season if you have a gentle rubbery rake. I have the 10” wide one, called a Merlin rake, which is often called upon for work around established plants throughout the season. 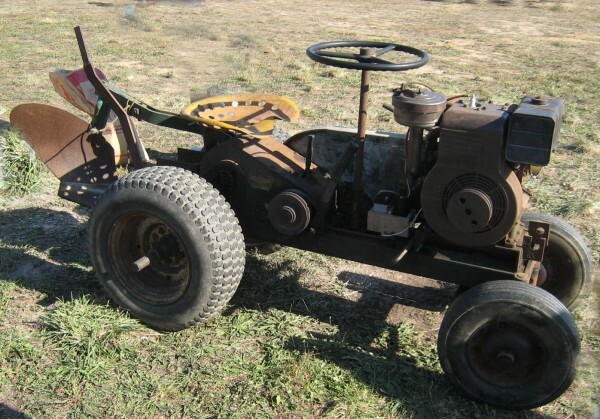 One of mine has been going for at least 15 years….even after all this time the rubbery tines and the frame are fine….if now paintless. The wider 20″ version of this rake, called a Wizard, makes fast work of larger scale places like the lawns, woodlands and paths. Once upon a time, Smith and Hawken also made a shorter handled version of the Merlin rake. Now, if you have close work to do, as in a raised bed or rock garden setting, you might consider cutting a long handled Merlin a bit shorter, to whatever length best suits your circumstances – and your comfortable reach. At least that’s what I did. Clarington Forge carries Wizard and Merlin rakes and I am so glad they do. Their company represents quality. Children and Grandchildren can freely use these soft and safe rakes. Here, they consider the short one to be their own rake, but we share. 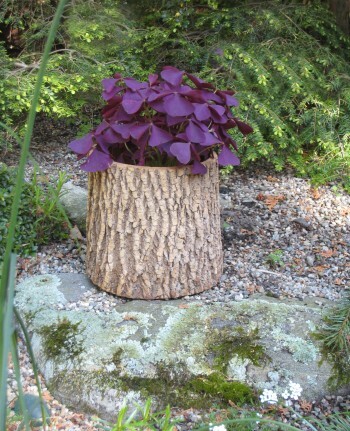 Each year around St. Patrick’s Day the Purple Shamrock, Oxalis triangularis, appears at many local florist shops and grocery stores. The charming merlot colored leaves of this handsome plant can grace a modestly lit place in your home throughout the cold season, and sometimes they can come to the table. Should I mention that they have the endearing habit of closing up their leaves at night, and reopening each day ? Makes them seem very alive. a starring role as a versatile garden plant all year round. that I would not want you to be without. 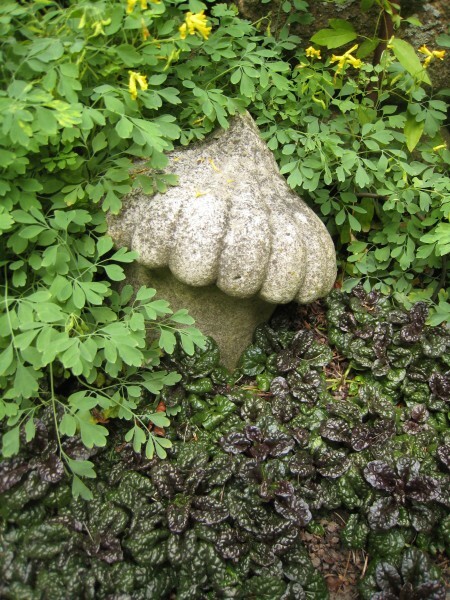 In spring, when it is suitable weather for tender plants to go outdoors, the St. Patrick’s Day clumps go into outdoor planters or the open garden. One third to 2/3 light places are fine. Just plant them where they can enhance the greens around them by contrast. 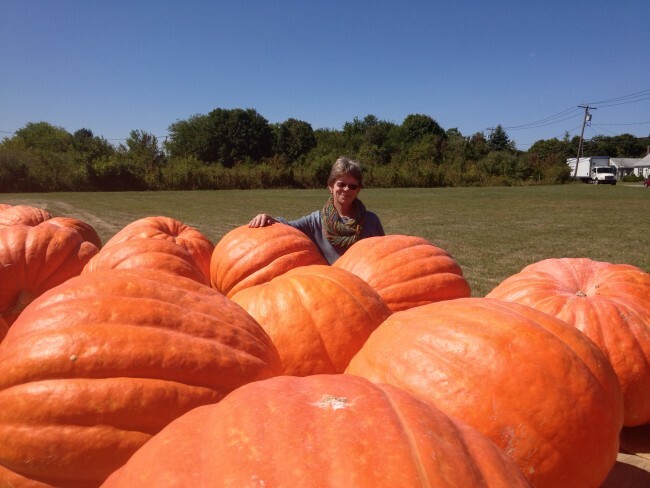 They expand and multiply admirably throughout the growing season. If you have some in the garden, before the first frost, take the parent plant and pot it up in a container you will enjoy looking at in winter. It is not fussy as to light though it needs some, and it is forgiving in the watering department. In the fall, by pulling apart the now abundant corms, I can provide the beginnings of a colony to a few more people each year by sending them home with a bit to embellish their winter and begin the cycle in their own place. Using this in and out system, a client of mine put her winter ones as a centerpiece on a long shelf by a bank of warm windows. She found the corms multiplied so extremely well both winter and summer in this good spot that, after some years, the entire 8 foot shelf was filled with with lovely containers of this purple shamrock. This despite the fact she is very generous and always gives lots away. This plant will accept modest light in a less than ideal place in the house, it will just multiply slowly till it gets back into the true garden in the warm seasons. Some clovers are not welcome in the garden due to their nuisance seeding and the difficulties of removal, but O. triangularis is an exception. In zone 5b it is not able to seed into the lawn or garden beds. If, instead of local plants you need to start with little dry corms by way of the mail, don’t worry, they will still do fine. I once attended a winter party where a barrel of hundreds of dry corms were nestled in wood shavings and set out for us to each take a pretty bagful home as a gift. Funny looking little things ! But if you just pre-soak them in water, pot them up in premoistened growing medium…and realise that it will be a bit of a wait, all will be well. Just water as needed so they don’t dry out again. With minimal water and care, they will flourish. It is easy to succeed, so growing her is a way of growing your own good fortune. 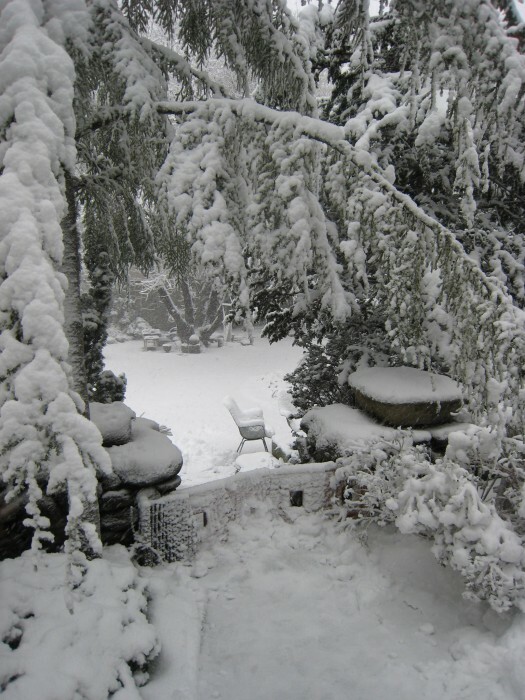 Taking Time over the drawing phase of your landscape making journey, whether you draw in snow, on the lawn or on paper, will strongly influence the quality of the choices you will ultimately make in the design of the things for your landscape. Drawing in your snow is a pleasant way to get thoughts going for your future projects. The great thing about snow as a medium is that it comes right to your house and presents you with a full clean canvas, allowing you to draw everywhere within your connected landscape, at full scale and all at the same time. 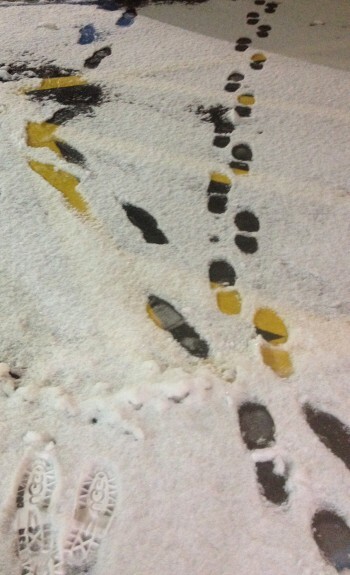 As you wander through the snow and mark the outlines of what you are thinking about creating, your feet will be exploring the the paths to important thing and the tangible future ‘footprints’ of built projects, planted beds. Once drawn out roughly, you can physically experience the relationships of all the landscape elements. Now you can walk everything to see how the flow and the relational shaping of your various landscape elements will feel. You can check from all directions, adjusting your imprinted lines until you are pleased with form, flow and linkage of the parts of your place. 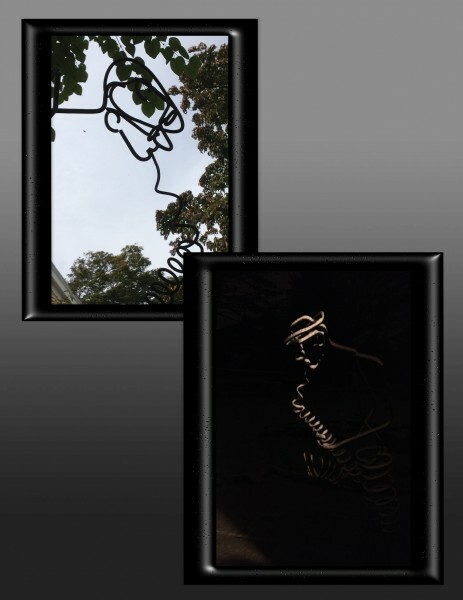 Once imprinted, you can check the views of your evolving outlines from elsewhere, indoors and out. Play with slow curves, fast curves, driveway apron curves, deck configurations, or anything you like. 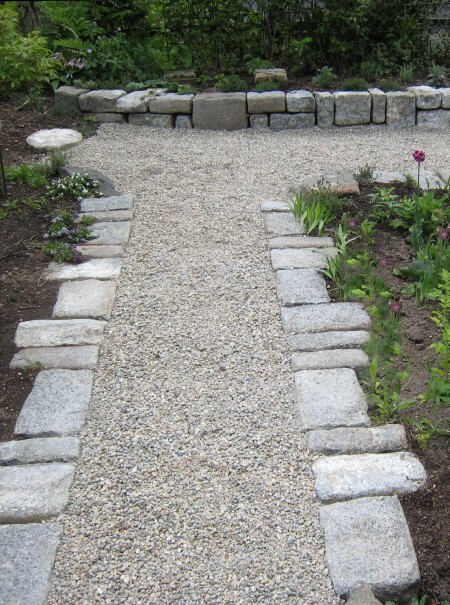 Site a wall or planted bed, consider shapes, beginning and ending points. Try out tree places, table and chair locations. You are searching for pleasing spatial relationships both functionally and esthetically. These beginning ideas will evolve as the projects come to life. Try to avoid random footprints as best as you can until your intended shapes are pleasing, but if the process gets messy, the next snow will provide a new clean canvas. You will have more chances to try various solutions if you start with the early light snows. With a tape measure in your pocket, you can give yourself some coordinates for key relational points to roughly record what your winter thought process has concluded. Even without much in the way of recorded measurements though, you will have learned alot from your experience with the snow lines, and the thoughts they engendered. By Spring you will perhaps have developed some ideas of what you may want, consulting your memory and measurement notes. Once the ground is green or brown again you can be laying things out in an exploratory way using some braided line, marking sprays and stakes. While having carefully considered your range of choices before beginning your projects, you may find that you want to adjust and fine tune your compositions right up to and even during the time of building. That’s fine. Leaving details as flexible as possible until it is necessary to finalise them usually leads to the best custom work with natural materials, if you can continue to pay close attention all along the way. The rug in my Garden Studio gets alot of footfalls. Muddy, slushy and sandy ones. My Polish Mason showed me what to do about that, then my Italian friend Janey said “of course that’s how you do it”. 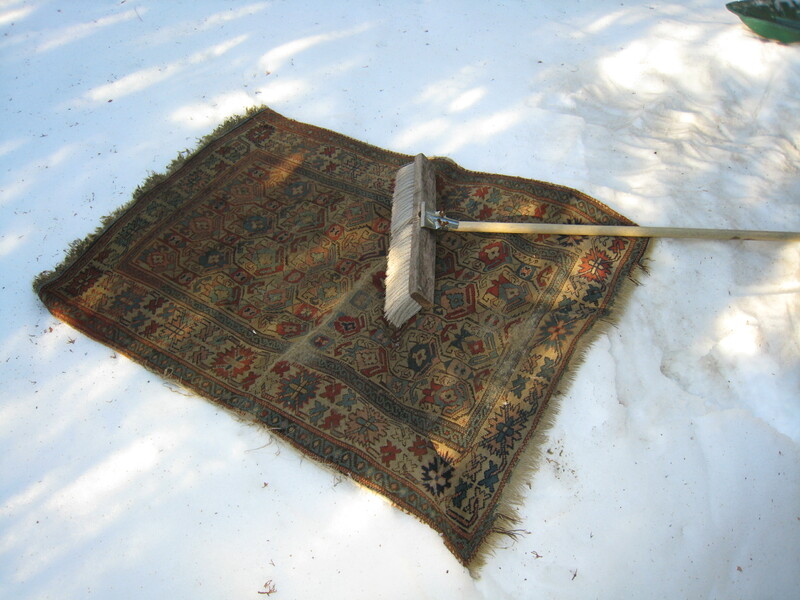 Well, I didn’t always know about this traditional method of winter cleaning rugs, but for years now I have found snow a fun, easy and inexpensive way to clean them, so I thought I’d show you the trick. Best with newish snow on a sunny day. You can see in Picture 4 how much sand and dirt can come out. That is very satisfying for me and healthy for the rugs. I wait for the right snowfall. A light to medium fluffy snow, up to the heaviness you would want to make a snowman from, is fine. Heavy wet snow is a much messier proposition, I wouldn’t recommend trying that. In order to get the snowflake moisture into the rug I use a wide soft push broom. Almost any broom will do except for stiff, course kinds since they might harm the textiles. With the broom I firmly tamp the whole rug down until every square inch has been snuggled into the snow. Then I flip the rug over in a nearby place and do the same thing. Next I go over the rug with a rug beater, one side then the other, moving it to a patch of clean snow each time. You have finished when the snow beneath stays white. 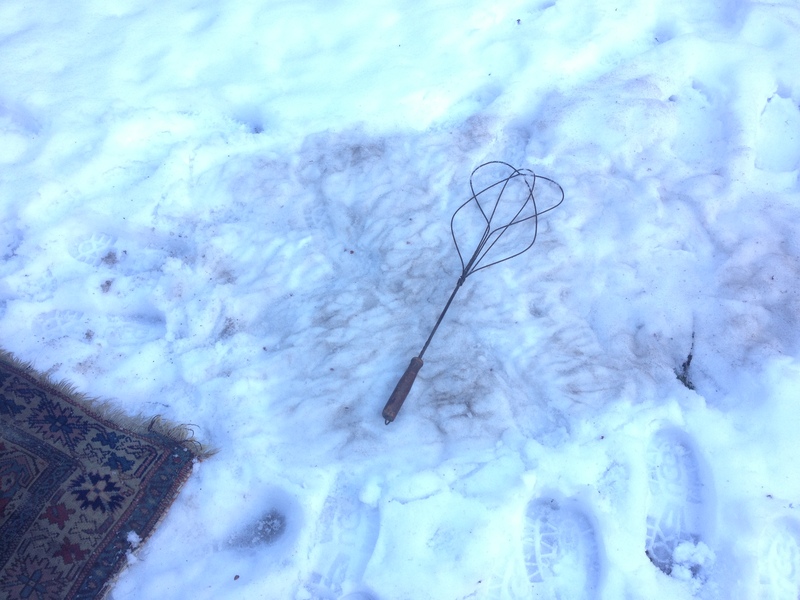 Before I acquired this rug beater, I accomplished the whole process with the push broom and that works very well too. And you don’t have to lean over as much. 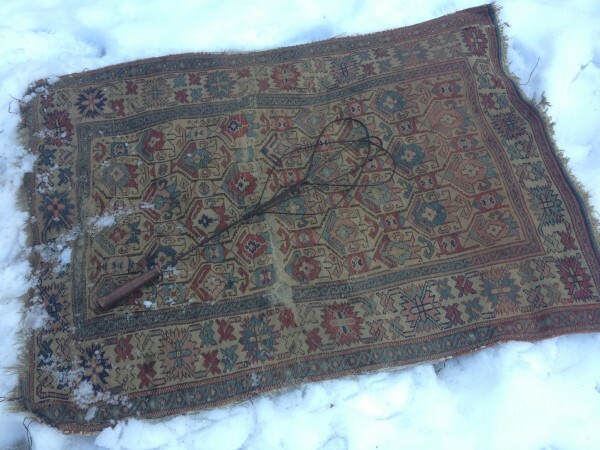 The rugs usually don’t get very wet in fluffy snow, so they won’t take long to dry. I typically drape each one over something in a sunny place for the rest of the day, maybe with a rag towel underneath if there is excess moisture. Often they can be put right back in place on their pads that same day. Or you can hang them over a bathtub until they are dry enough. It is better not to leave them to freeze outdoors since this is hard on the fibers of the rugs. 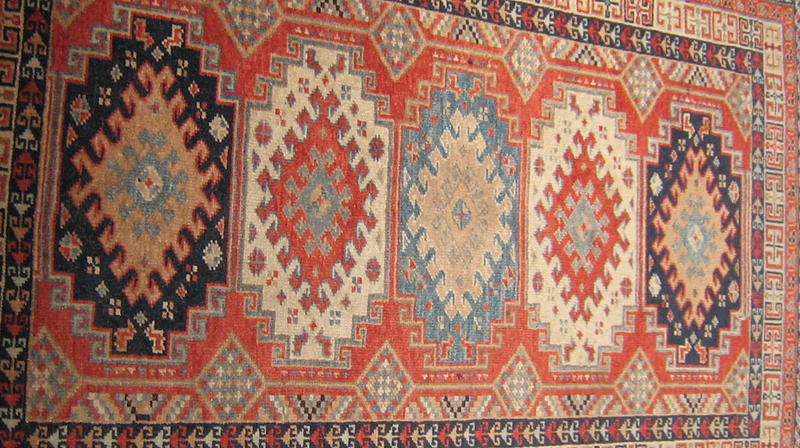 I clean all the small rugs from the house like this, up to 3′ x 5′ or so. …Anything to get me out into the garden in all seasons, it would seem. 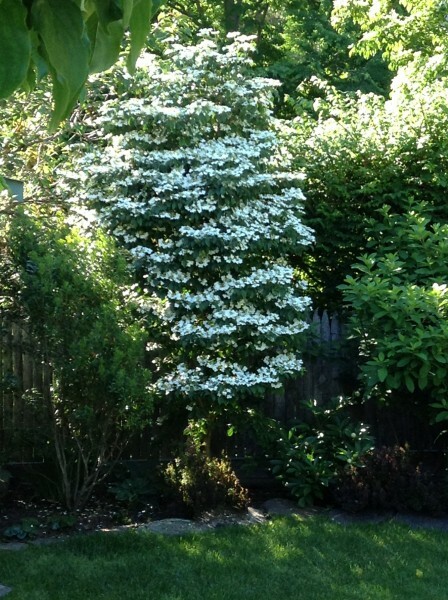 in New England, Zone 5b….. Staunchly evergreen, most Hellebores are treasured for their handsome leaves in all seasons and for their flowers through winter and early spring, when there are few other showy plants in the landscape. Some have a unique and endearing quality of flowering in subfreezing winter temperatures, even when snow is on the ground. Hellebores are available in a great variety of kinds, with various statures, colors and flowering times. Those that flower outdoors around December 25th are colloquially called ‘Christmas Roses’ (often Helleborus niger varieties). Spanish researchers Carlos M. Herrera and María I. Pozo have discovered that among yeasts common in nature, some react particularly well with the sugary nectar of Hellebores, warming the airspace within their flowers. 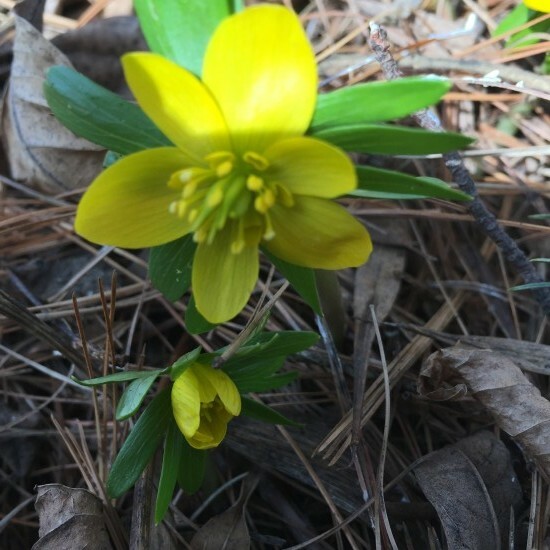 It is likely that this reaction is a great help in allowing some Hellebores to bloom through the cold months of Zone 5b. 1. Shady places are usually fine for them. 2. They have few pests and are deer-resistant. 3. They require maintenance only once or twice a year. 4. 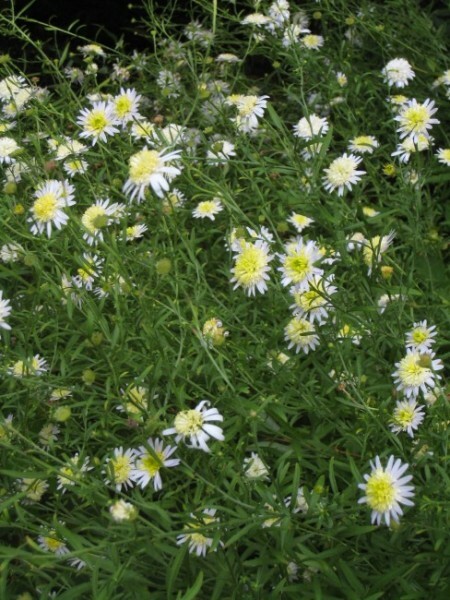 They are often evergreen, and handsome individually and in groups. 5. Most of them flower for a long time. The favorite kinds I represent below have everything – fabulous flowers, lovely leaves and good behavior in the gardens here. Most gardeners end up needing to make choices for the allocation of their planting places, so I thought I would share my very Favorites. Not all Hellebores are equal. The biggest problem is that lots of kinds of Hellebores have flowers that face the ground so we can’t see them very well from above.While they are great plants in many other ways, Hellebores don’t generally look at you. Downfacing flowers can be lovely, but if you could see them better you would be happier still. When I first met Helleborus Jacob, the Heuger company was introducing it at ‘New England Grows’ in Boston. Their entire display was made out of this plant and one other, H. Joseph. There were perhaps 100 plants in full and perfect bloom and as I walked by they were all looking at me ! That stopped me in my tracks. The delightful habit of this particular plant is to have upward and outfacing flowers. H. Jacob have proved reliably perennial here in Zone 5B since 2009. Their dark evergreen mounds are a handsome winter feature when they are not in flower. 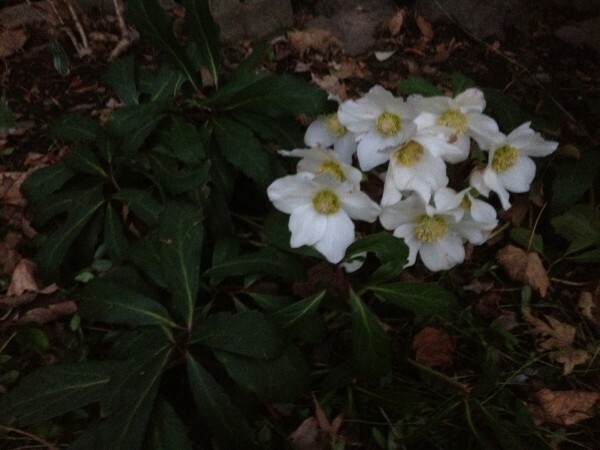 Since H. Jacob begins to flower in late December or so, truly it is a ‘Christmas Rose’. 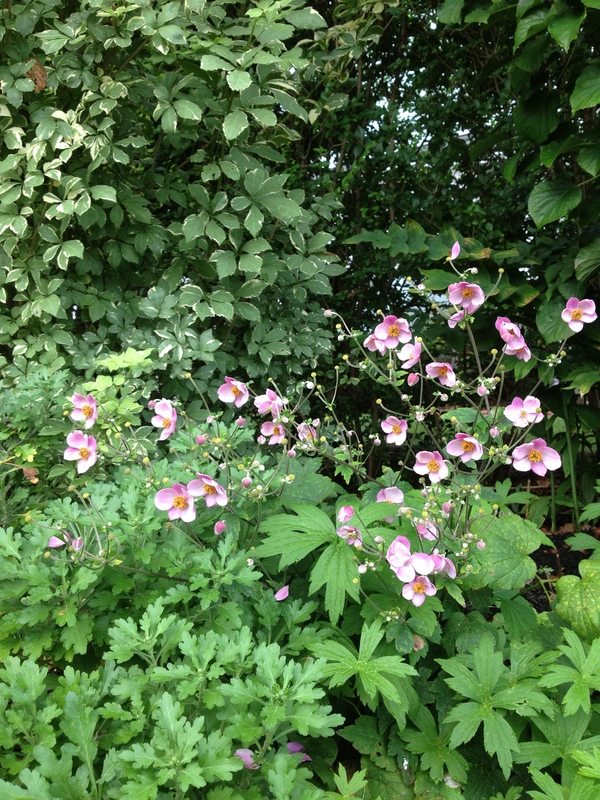 The flowers continue to develop and cover the plant, the scene lasting beautifully for months outside. Even if they spend some time under the snow, the flowers will be there for you when it melts and reveals them. Trim when tatty. H. Jacob is also sensational as an indoor Chanukah/Christmas/New Year plant. If encouraged by the grower, once you acquire it in bud, you can expect a month of flowering in the house. Luckily, for a couple of years now, our local good ol’ Trader Joe’s has had H. Jacob for sale in full bloom by December. Google can surely provide other sources. As soon as the ground thaws, you can plant these among your perennials and they will probably return happily ever after. 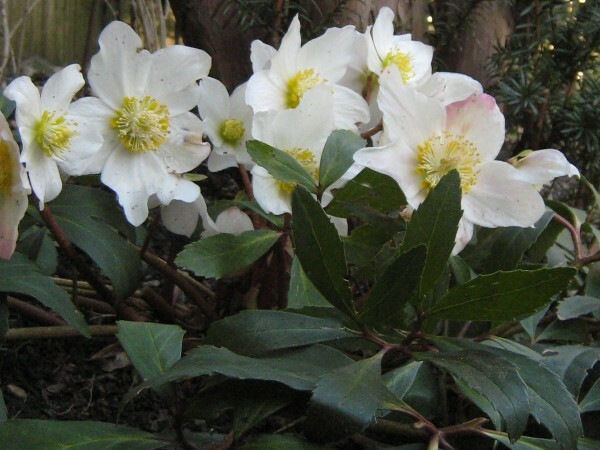 Helleborus Jacob and other similarly special plant outcomes are a result of extensive Heuger breeding programs. In the years since I met them in 2009, they have developed white doubles and deep maroon forms and many with brushed faces of two colors….and they face outwards. ……I will be surely be watching their future releases for more good bets in this Genus especially their Helleborus Gold Collection, HGC for short. 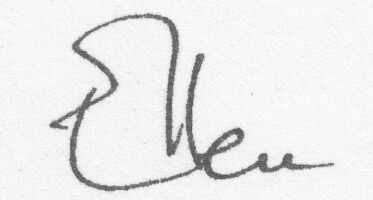 These initials will identify the Heuger varieties. The various Hellebores provide a wide variety of flower colors including near blacks, tints and shades of purples, wine reds, greens and pinks. I especially like the deep wine and purple colors of some of these cultivars. The reds draw your eye from a distance, and show well with their own greens against snow white. The Royal Heritage hybrids closely resemble H. orientalis. 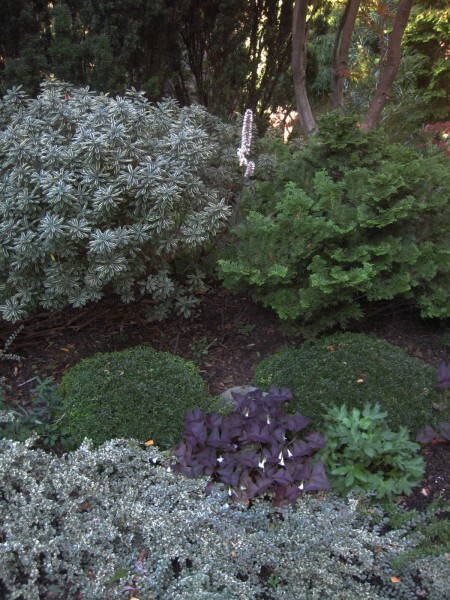 Nodding flowers adorn graceful, glossy evergreen clumps around 2’ tall. Many spread extremely well from the parent clump. These are more of a ‘Lenten Rose’, typically flowering closer to Lent than to Christmas. Unless tattered by the elements, they stay nice until late May. The flowers look great even as they go to seed. Leaving them on the plant for a long while increases the probability that some babies will appear nearby, over time. While the seedlings will not be just the same as the parents, one can select one’s own best babies, and keep good colonies going. The crown of the parent plant will expand over time and you can divide off the younger sections to get more plants, and those will be like the original parent. In fact, the foliage and flowers of many Hellebores last kind of indefinitely, but at a certain point begin to look a bit dingy and frankly Helle-boring when seen next to other freshly unfurling spring leaves. If by June you have trimmed off the flower stems and oldest leaves of your Hellebores, the airspace the old leaves occupied in the cold weather can be ‘borrowed’ for a few months by nearby effervescent perennials in their showy seasons. As their season ends, they will be been cut down, there will be good light and air for the Hellebores, encouraging new shoots to develop. When these next new leaves arrive, you will be rewarded with a fresh appearance which will last throughout the coming winter. With a thoughtful approach to design in your landscape, everything you make will be satisfying because is it useful and beautiful…..but of equal importance is that what you choose to make will be connected to your own ‘I’, with the outcomes reflecting your personal wishes. By considering what matters a lot to you and what doesn’t, the landscape will contain the best design solutions for Your Place. To find your own ‘everything’ in the planning stage, the landscape thought process starts by reviewing your most important ultimate personal goals for the property. It will help if you make a list of your needs and wishes, clarifying for you or your landscape designer what it is you wish to do in your landscape and thinking about where it might be best to do those things. The details may be determined as the landscape thoughts develop, but the purposes of the place and the structural features need to be considered beforehand. Even if only a few of the elements will be built in the nearby future, roughly designing in the places for all the important things early on in your plans will give you a better chance of finding good locations for each of them and having them join up gracefully in the end. Success lies in the complete realisation of one ideal, the ideal for your place. Style is an overlay that can come a bit later in the design thought process. will become Centers in your design planning. Essential elements such as water sources, gathering places, entrances or parking are destined to become Centers in your outdoor life. Any Centers with fixed locations, whether existing or planned, are starting places for your designs. Subsequent organisation takes these as the givens and works around them. Each Center has a field of effects all around it. Each fixed location Primary Center will need certain things close at hand to make the place work optimally for its purposes. Related considerations will then direct the design of the Secondary Centers whose locations are flexible but whose existence is essential to the whole. These accessory parts of the landscape develop naturally in creating good relationships between them and the primary centers. The Secondary Centers may be places to be, or elements with content to serve your purposes. It helps me to think of Centers as acting somewhat like magnets. Things will flow towards and away from Centers because of necessary interrelationships for our good use of them. 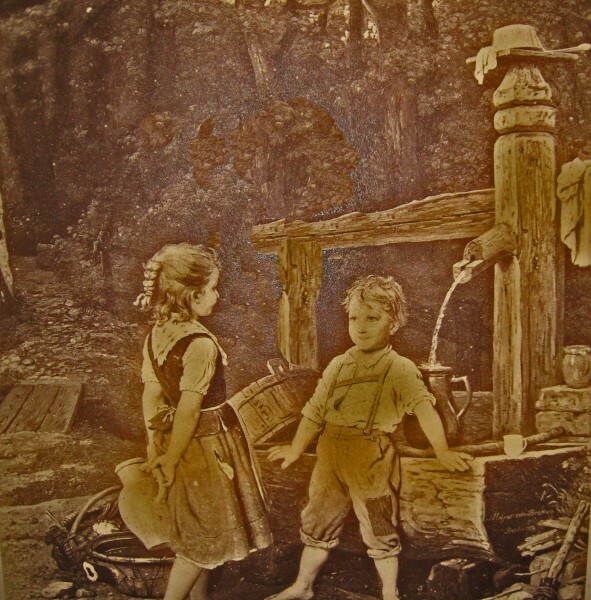 Above, the well water has brought the buckets, pitchers, cups and children to its place. In the case of the well, you can anticipate needing paths to get there nicely, a place to work with the water, a surface to put things on and and perhaps a place to sit. Such Secondary Centers are flexible in location, though no less important. They are designed into the landscape with respect to the fixed Centers, to establish configurations that create or allow best use and linkage between all the parts of the place. You are Designing in sets of things. Every decision affects other aspects of the whole landscape. is part of “a larger wholeness in which it is embedded. Within the framework of your overall goals you can explore many ideas regarding the combined organisation and linkage of your centers. Once you have identified your centers, you can begin to physically uncover how to best connect them. The paths deserve first consideration. They will later guide your everyday journey of experiences and views and can unify your surroundings. They steer you when you enter and leave the place and determine how you move through the spaces within it. Roughly sited at first, path shapes can be adjusted during the design phase to work around other landscape elements. Design is the process which helps to make everything work together, physically and esthetically, in the best possible ways within your home grounds. 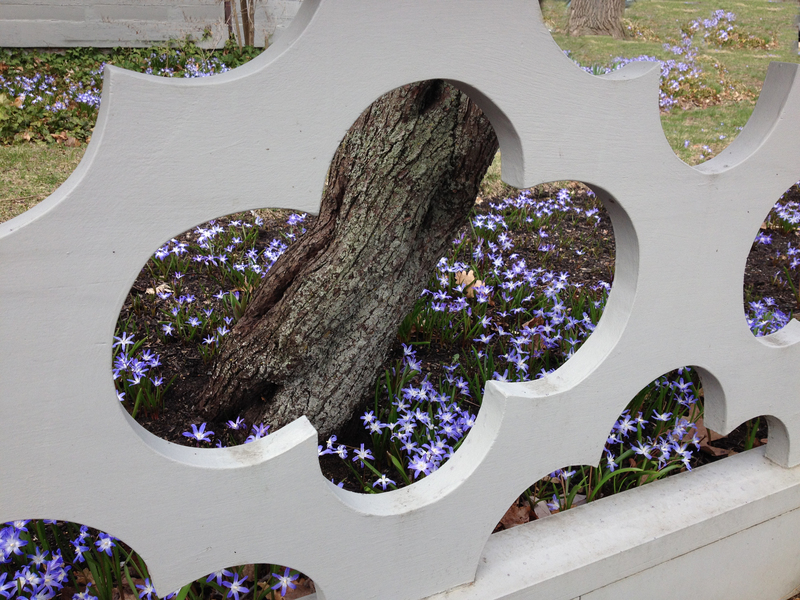 Landscape design is really about problem solving. Your problems and needs are guidelines, shaping your design solutions. Like every kitchen, every home landscape must have a certain basic set of features, tools and materials to serve its various purposes well, no matter what the size or complexity of the place. Beyond these essentials, just as an enthusiastic cook often wants a more complex kitchen than someone who doesn’t cook much, there will probably be more ‘parts to your whole’ if you want to do alot outside. The more parts there are to your set of wishes, the more inter-linkage there will need to be, and the more design and building decisions you will probably have to make to accomplish those extra goals. The design choices all along the way usually come down to the implications of each decision – If I do this, then what else happens or can happen? There will be lots of choices and some compromises. The thought journey to find the best way to organise things is working out your own personal maze. To find the best ‘journey’ you need to make design choices that will allow all the parts of your place to be conjoined as well as possible. Your chosen solutions will choreograph your daily life. After the landscape comes to life, there should be a flow that feels easy and right, visually and physically. Anything you are making can become multipurpose. Many of the things you will be building anyway create opportunities to resolve multiple landscape needs or wishes almost automatically and in the same footprint of space, making a big difference in the overall use possibilities within your place. 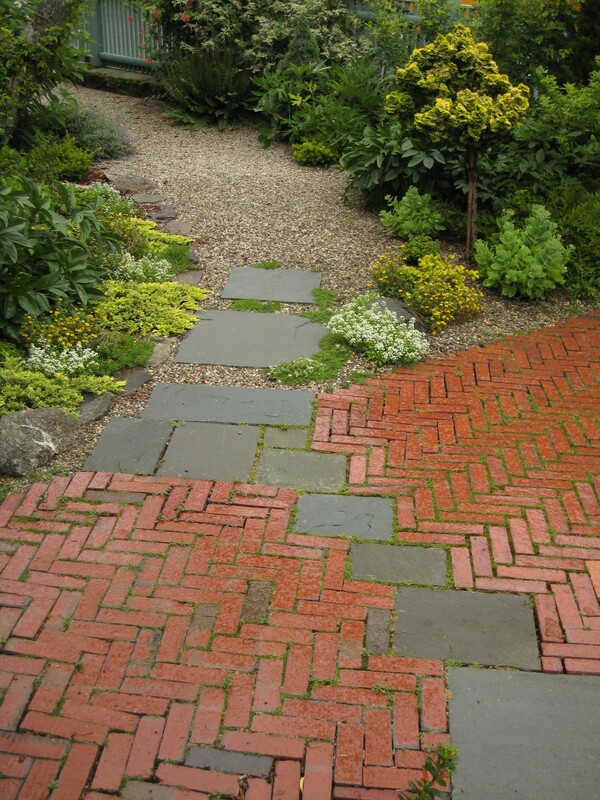 Paths can become outlines for planted beds or hopscotch configurations, or perhaps they can stretch at some points and become floors in sitting areas. An under deck space has storage or many other imaginative possibilities. Steps can become seating and tables if so configured. An extra long step provides room for a planter or a grocery bag drop spot. These kinds of details allow more life in a given place. 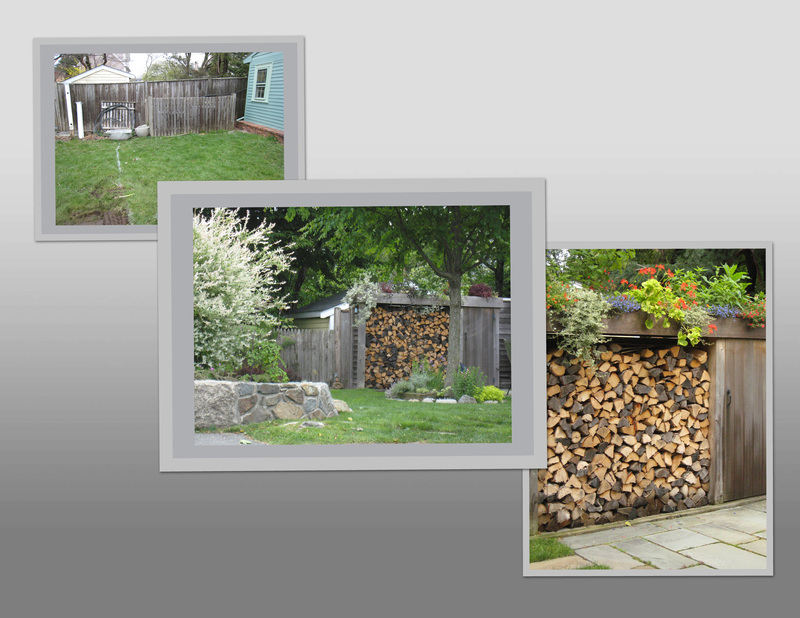 As an example of multi-purposing, the collage below shows how we hid 2 air conditioners by what might have been a simple fence, but instead, by design, that needed fence also became wood storage, a tool cabinet, and a hide-behind place for miscellaneous. Over this construct, a planted roof enhances a previously unplantable part of the property. You want to avoid having to do things twice or cross over finished work to get to your next project – the dreaded backtrack. Your landscape plan may be built over time, and where you begin the actual work will depend partially on personal priorities, but whatever your plan essentials ultimately are, you will want to find a good sequence for the making of them. By taking into account the logistics of the work and implications of each project for those that will be needed in relation to it. Although these accessory parts may be completed later, you will have found the least overall cost to accomplish them. Things that you will want in the end are often most easily added when the ground is dug up anyway for other projects. This concerns things like laying live water or irrigation pipes or conduits for wires under paths or patios as will ultimately be needed, anticipating future connections, or deep improvement of the earth in planting areas before adding new surface loam. It might concern saving a material you are digging up for use in one of the other parts of you landscape that will need it. Simple to do at the right time, but if the same things needed doing later, it would mean re-digging work you had already completed. using opportunities as opportunities arise, is a goal in itself. If you wait until the surroundings begin to come to life, you can do the most finely tuned assessment of the best choices for the details of your next project. Sequencing the overall building of the landscape thoughtfully to retain this kind of flexibility allows you decide what needs to be decided for the work you are doing while leaving final detail adjustments for building each next part of the work…. until you are closer to making it. For efficiency’s sake you always have to stay well ahead of the work, ready for each next project in design and materials, but this planning method will allow insights all along the landscape building journey to enhance the quality of your outcomes. Creating a place to receive your life in a considerate way takes alot of thought and planning. You will want the elements of your outdoor life to be comfortable and well organised so that you can enjoy whatever you will be doing in your landscape. Just walking your paths can be a daily source of joy. So now you just need to find the Good Beginning and all will be well. Making the landscape ready to receive people and plant materials is where it all begins. Thoughtful design with both hard and soft materials will make for successful places and plantings. If you care deeply about your landscape and gardens, once you make a good beginning, the interactive immersion may never really have an ‘ending’, no matter how well planned for low maintenance the place may be. There will probably always be little things you want to do. If you have others doing the mowing and general upkeep, you may not ‘need’ to do many things, but if you have a biophilic nature, you may well want to. It always makes things better. As your living things grow and change, there will always be some touching involved in your relationship with them. For many people, that is part of the charm. You will probably enjoy your own landscape making journey more if you have clues that reliably lead you to pleasing outcomes while avoiding common pitfalls. The guidelines provided in these advisory chapters should help with that. Take a photo series of the whole property before you begin. These will be your ‘before’ pictures, so be thorough because like baby pictures, you won’t be able to take them later. I promise that you will enjoy having a record of how far you’ve come, as things progress. I typically take a sequential series of photos, images of views seen traveling back and forth on all the natural pathways of the property. Unimportant views can become important later as your place develops. You are after a record of what is accomplished, as well as of the underground work which will become invisible later. Photos during the landscape making process become part of the history of your place. Start a file folder labeled Landscape. Even if you are keeping much of your information in a computer, there will be lots of images and bits of paper from the tangible world that you may want to refer to later. A legal sized folder may serve you best because drawings and plot plans are often oversize, and anyway things accumulate. Receipts for the landscape work can be important to keep since they can become potential ‘capital gains’ deductions applying to the cost base of your home, should it be sold later in its life. Gather images which reflect your Favorites. Collections of images of the kinds of colors, places, trees or features of any kind that appeal to you will be useful in many ways. Gathering visual aids encourages you to think about ideas further, perhaps refining your own vision. Color, texture and spirit are notoriously hard to describe. When you talk through your ideas with the designer or builder of a project, conceptual sketches and gathered images will help you to communicate your wishes. A picture can easily be worth a thousand words when you are trying to explain esthetic things. Property lines are not always as you think they are. If the edges of your property are involved in your design and there is any question about them, to avoid future neighbor or town problems a survey of those boundaries is recommended. Surveys are important to the future of a place. Don’t accept bits of orange ribbon in the shrubs. If a survey is done, you will want somewhat permanent markers to be placed on the land in key locations. 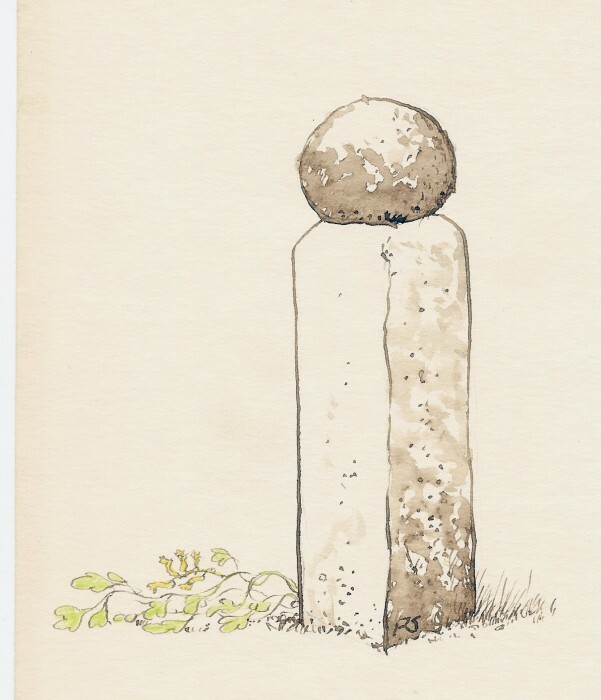 Ask for this, as strangely it is not always provided otherwise.Deeply set metal stakes can work well, unless you have some large chunks of granite to move into place as handsome boundary markers. A 10 or a 12″ nail can be used in a pinch and replaced later with something more permanent. Locate or make a basic outline sketch of the house on the land. You will probably want basic sketches of your buildings and landscape parts drawn in relation to your overall grounds, with some dimensions. Existing plot plans or architectural drawings may be helpful but are often incomplete concerning details of outdoor features. Older plans of any kind should be checked for accuracy, since one finds that the particulars may not have been taken as seriously as they are today, and anyway changes could have occurred over time and not been recorded on the particular documents you have in hand. If the available documents are too large or too small to be useful, have the relevant parts reproduced in a better size. You may decide to begin by just sketching one part of your landscape, making a simplified base drawing of the part of your grounds that you will be reworking. 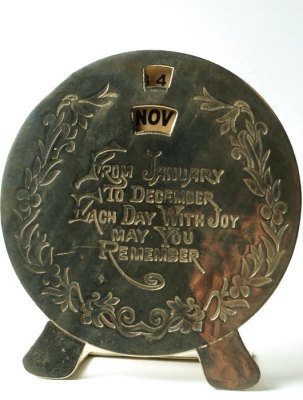 You will want to note the locations and dimensions of all elements you have and will keep. Copy your base drawings a few times. To avoid having to make basic drawings by hand more than once, file away clean copies of them for future use before you begin to add any exploratory ideas to them. This way you can take messy notes as you gather information and ideas and consolidate later on a clean copy. Before building anything, you will probably be considering alternatives mentally, visually and physically many times. This is the iterative phase of your design process, the exploratory part, and you can learn alot by playing with the possibilities and Moving things around on paper and in your mind is the easiest way. You are making thinking drawings and tools of memory. These just represent a pre-visualisation of your evolving ideas, with some dimensions and notes, reminding you of things you have decided or ones you want to think about more. The quality of your sketches won’t matter much since the only person who will need them at these early stages will be you, so don’t be shy. During the process of co-developing the designs for all the related parts of the landscape, you may make a few wrong turns and need to back up. Adjust until you have finished thinking. Nothing will be ‘set in stone’ until you decide it is time. What matters is the thoroughness with which you can consider the projects if you have drawings and images at hand. Through the rough but tangible exploration that drawing engenders, many considerations come to mind, and thinking about them will infom your design solutions. The sketches are a tool in your design thought process. They are not intended to be building drawings, which come later if they are needed, perhaps through the hands of professionals. As you find things out about your place, whether concerning boundaries, drainage, underground lines, loyal service providers or stories of your plants and your land, try to write them into your files. Otherwise, before long, you will probably wish you had done that. Prepare carefully for upcoming work. Take time over your planning stages. It will make all the difference in how well everything will go. This means sequencing the work well, and staying amply supplied with necessary tools and chosen materials. Stay ahead of the work by looking at options at the right time. All such things will help to keep your work going smoothly and that saves time and labor costs. ‘Measure a hundred times, cut once’. Basically, however many times you have to think about something until you are sure of your decisions will be the right number of times. To do any digging for the projects on your property, you will legally, and for the sake of Safety, need a Digsafe Permit. Requesting this will result in physical markings being drawn on your land by various utility companies and town departments, usually within a few days of your call. The markings will show you where underground services come into your property from the land around it, locating gas, electricity, water and sewer pipes are so that you can work safely around them. To avoid running into underground utilities within your property you may also need to contact Private Service Providers. Such things might be, for instance, cable lines, private electrical lines, invisible fencing, irrigation and outdoor lighting conduits or drainage systems. For design purposes it is good to know early in your work where the underground utilities run since this can affect where you can locate other things in your landscape. Once you have the markings, you can make a record of where things are for general reference in future. If some time elapses between the designing and the actual digging work, you may need to renew the permit for official markings. Unfortunately the marks are often in brightly colored, non-soluble paint. When all your work is complete, if they are on asphalt, you can overspray them with asphalt colored paint to help them disappear. No matter how young or old your house is, your land had a history. Some investigation will help you to find out about your place, historically and ecologically. You can gather old photographs and documents that you, the town or the local Historic Commission may have for your house and land. Old pictures may show details of things lost over time that could be restored if worthy. Who knows… a foundation may still be there…or maybe the original brackets and balusters on the porch show in that 1920 photo? 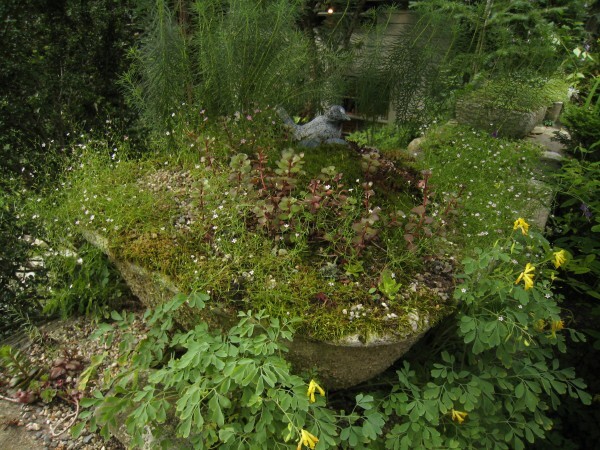 Rock gardens can be made to reappear. Maybe your land was once a swamp or a quarry or a farm ? Old houses have especially many stories embedded in them in relation to the land and local ecotome they have been part of. You would probably enjoy knowing some of them. In the course of our work we have uncovered old well sites and bridges, native American hearthstones, hand cut granite foundations and pavers, beadmaking stones, stone toys, and lots of 18th and 19th century artifacts and shards buried by time. The revealed history often influenced the design spirit of what was made for the particular place. For planning purposes, the landscape thought process starts by reviewing your most important ultimate goals for the property. The details may be determined as the place develops, but the purposes of the place and the structural features need to be considered beforehand. It seems to me that everything a person creates is most satisfying when it connects to their own ‘I’. Finding your own ‘everything’ begins by considering what matters a lot to you and what doesn’t. It will help if you make a list of your needs and wishes, clarifying what you wish to do in your landscape and figuring out where it might be best to do it. Essential elements such as water sources, entrances or parking are destined to become Centers in your outdoor life. These and other Centers with fixed locations, whether existing or planned, are starting places for your designs. Subsequent organisation takes these as the givens and works around them. Each fixed location Primary Center will need certain things close at hand to make the place work optimally for its purposes. Such related considerations will direct the location and detailing of the flexibly located Secondary Centers. These are the accessory parts of the design that develop naturally in relation to the Primary Centers. The Secondary Centers may be design elements or places, with content that serves your purposes. Their existence is essential to the whole. Above, the well water has drawn the buckets, pitchers, cups and children to its place. In the case of the well, now we will need a place to work with the water, a surface to put things on and and perhaps a place to sit. Such Secondary Centers are designed into the landscape with respect to the dynamics of the fixed Centers, to establish configurations that create or allow best use and linkage between all the parts of the place. Once you have identified your centers, you can begin to physically uncover how to best connect them. Within the framework of your overall goals you can explore many ideas regarding the combined organisation and linkage of your land. The paths deserve first consideration. They will later guide your everyday journey of experiences and views and can unify your surroundings. They steer you when you enter and leave the place and determine how you move through the spaces within it. Design is the process which helps to make everything work together physically and esthetically in the best possible ways within your landscape and home grounds. Problems are guidelines, shaping your design solutions. Like every kitchen, every home landscape must have a certain basic set of features, tools and materials to serve its various purposes well, no matter what the size or complexity of the place. Beyond these essentials, there will probably be more ‘parts to your whole’ if you will want to do alot outside, just as an enthusiastic cook often wants a more complex kitchen than someone who doesn’t cook much. The more parts there are to your set of wishes, the more inter-linkage there will need to be, and the more design and building decisions you will probably have to make to accomplish those extra goals. The design choices all along the way usually come down to ‘If… Then ?’ propositions. What are the implications of each decision – If I do this, then what else happens or can happen? There will be lots of choices and some compromises. 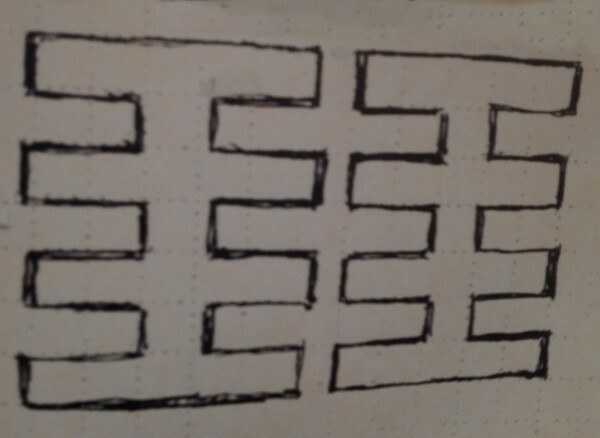 The thought journey to find the best way to organise things is working out your own personal maze. To solve the maze you need to make design choices that will allow all the parts of your place to be conjoined as well as possible. Traveling the maze after the landscape comes to life will then have a flow that feels easy and right. Your chosen solutions will choreograph your daily life. “When I am working on a problem I never think about beauty. I only think about how to solve the problem. 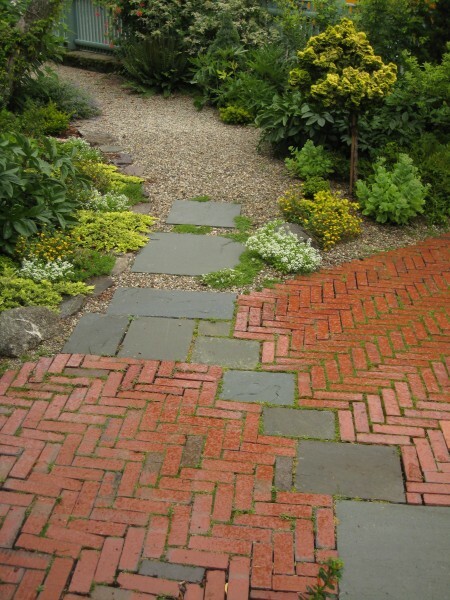 Many of the things you will be building anyway create opportunities to resolve multiple landscape needs or wishes almost automatically, making a big difference in the overall use of your space. You want to avoid having to do things twice or cross over finished work to get to your next project – the dreaded backtrack. Your landscape plan may be built over time, and where you begin the actual work will depend partially on personal priorities, but whatever your plan essentials ultimately are, you will want to find a good sequence for the making of them. This will help you attain your goals with the least overall cost by taking into account the logistics of the work and implications of each project for the elements that will be made later. Things that need to be conjoined in the end are often most easily accomplished when the ground is dug up for the earlier projects. This concerns things like laying conduits for electricals or irrigation under paths or patios, or deep improvement of the earth in planting areas before adding new surface loam. Doing the same things later would mean digging up the work you had already completed. If you wait until the surroundings begin to come to life, you can do the most finely tuned assessment of the best choices for the details of your next project. Sequencing the overall building of the landscape thoughtfully to retain flexibility allows you decide what needs to be decided for the work you are doing while leaving final detail adjustments for building each next part of the work…. until you are closer to making it. For efficiency’s sake you always have to stay well ahead of the work, ready for each next project in design and materials, but this planning method will allow insights all along the landscape building journey to contribute to the quality of your outcomes. All of a sudden, after years of peace in the skunk department, we had a nasty nightly fragrance in multiple adjoining yards. Several dogs and a couple of people had been squarely hit, and the neighborhood smelled decidedly skunky most mornings. Just a few weeks before our Open Garden and a family party, a serious scourge of skunks. Oy. One night I saw the stripey fellow go through the yard. Luckily I was behind a window observing unsuspected. It would seem he or she was trying to make a home under our upper shed. Having just seen the preferred path through the yard, what could I do with that information? Tethered leftovers from a garden party, two shiny mylar helium balloons bounced around in the wind. I had noticed that in our night lighting, their silvery hue and bright smiley faces eerily jumping in the breeze made them seem startlingly alive. 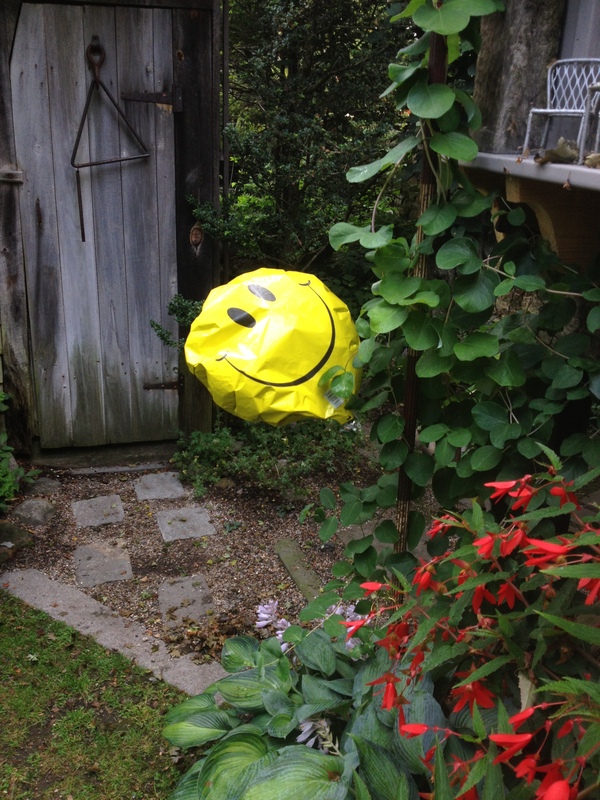 At least, they kept startling me, so I tied the balloons low down, right where they would glare at the wanderer alongside the runways of his nightly journeys. If you know the likely skunk paths you could tether a balloon near each of them. It would seem that our visitor was spooked, because he moved camp within a day or two. Skunks have low vision and a keen sense of hearing, so the shininess of the balloon may have mattered, and the crinkling of the plastic as the balloon bumped into its tether post may have helped too. In case if it was the balloons, it would be an inexpensive trick to try if you want to discourage a visiting skunk. The Dollar Store will provide. You will need some outdoor lighting to shine on them. Maybe it was all those people, dogs and balloons to defend against in this neighborhood, but ………..might it have been the guard balloons ? You could call them semi – automated skunk scarers. I hope this trick may help some of you to discourage skunks from making their living too close to your home. This is the fourth successful year with this technique…..there are only a few times in the year that the skunks do much moving around, so the dollar balloons are bought perhaps twice each year, when ‘skunk is in the air’. They do their job for a couple of weeks since they are wind-activated. 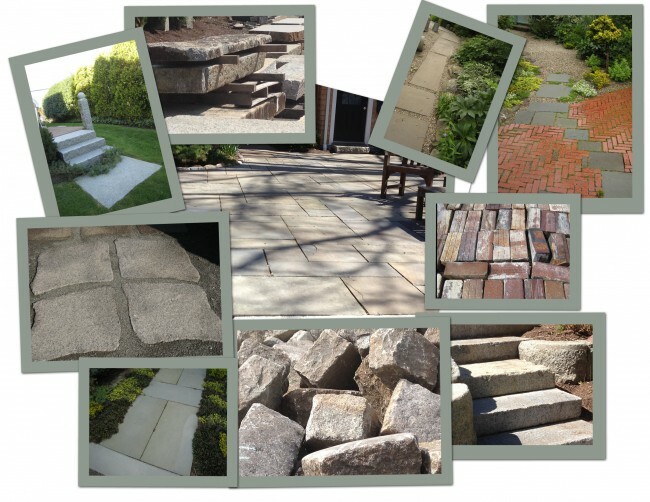 by Stone Garden Designs Inc.
All the landscapes shown in these slideshows have been made by our company, but they have been developed in collaboration with their Owners. It is they who are truly responsable for bringing the landscapes to life and keeping them so well. I am grateful for their permission to share these images. I hope that the pictures will help you imagine possibilities for your own place. Please go to the link below for the Slideshow. Miniature gardens can be very satisfying elements in small personal landscapes. 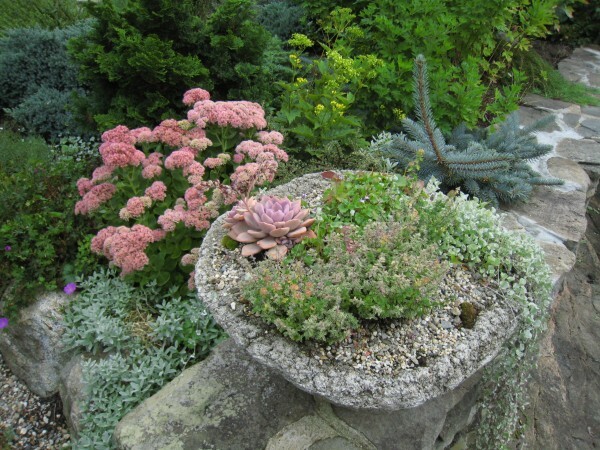 Hypertufa and stone troughs or copper pots are among the best of planting containers, remaining in place outdoors through all the seasons, and lasting for many years. It turns out that there are a lot of perennial plants which are preadapted to the kind of life one can have in a trough in New England. Certain kinds of plants, many of which are choice and beautiful, will return on their own year after year within such outdoor containers, without any protection in winter. Floriferous annual plants and quite a few useful herbs also thrive in these small habitats. If you are very fortunate, an old stone sink or a horse trough may turn up. Such things can make ideal small garden beds, but are hard to come by, so I would start with hypertufa containers which can be bought or cast with a good recipe. Hypertufa is a man-made material, so named because it imitates natural lime laden, porous Tufa rock in chemistry and in physical properties. Many kinds of plants will grow well in either one, and some especially like the lime. When you are choosing the plants, if you will be having multiple varieties in a single container, it will be important to find kinds which have similar biological needs since they will share this small ecotome. 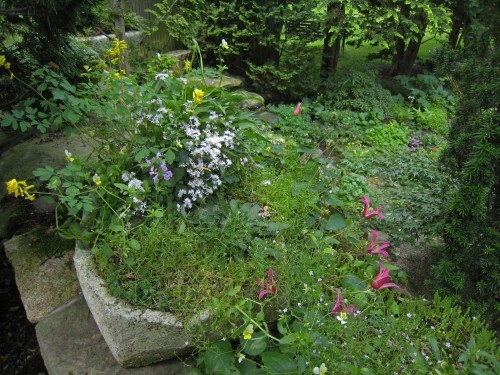 The little gardens also will usually look best and be most easily kept if the companions are chosen to be similar in scale and speed of growth. For easy sustainability, the trick is to choose appropriate plants for the ecological circumstances you can offer. When the troughs are planted to suit the place where they are sited, they never have to move. The tending maintenance of well planted and considerately located containers can be very minimal. Basically, these are self-contained ‘raised beds’. You can choose to keep them at a heights which allow you to easily see, touch and tend the residents. Located by design in places where you can get near to them, each trough can become a whole landscape picture, filling your close view. The container can stay there for life or move readily if that pleases you. 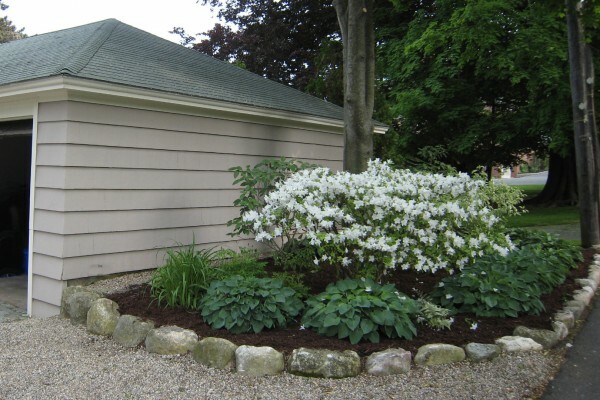 If you have a stone wall, atop it may provide an ideal place to set them, but they can be sited on any sturdy shelf or structure that can support their weight. The troughs allow their chosen occupants to avoid competition from other plant materials. Such miniature gardens can therefore be especially enhancing when sited under trees. With freshly beautiful colonies settled safely in their special ‘beds’, they can ornament rooty places where, otherwise, not many things could manage to grow. It is perfect when, in their chosen locations, your containers get lightly watered automatically by in-ground irrigation, if you can arrange it. Even if you irrigate though, it is advisable to select sites where you can easily provide a little custom watering sometimes. Being small in volume, containers lose their moisture more quickly than earth places do. They don’t need a lot of water, but they need it regularly. Locating your troughs where there is some shade at the hottest times of day will make things easier to manage. Too much sun may cause the containers to heat up and dry out too fast, even for sun tolerant plants. Hypertufa troughs and pots can be made in a great variety of shapes and sizes, custom to whatever your spatial needs may be. If you have the ambition and a largish place to make an outdoor mess, you can create your own containers if you wish to. Basically, the material is composed of a simple mixture of cement, perlite and/or very course sand, strained peat moss and water, whose proportions vary somewhat depending on whose recipe you use. When thoroughly moist, the composite material is simply pressed into a shape with a form or over sand, then allowed to set for a span of days in a shady place. The mixture will be stronger if it cures slowly, so it is kept covered in plastic sheeting. Although I may take the container off of its mold after a few days to use a wire brush or file on it for shaping and/or texturing before it sets up fully, after this touch up, I turn it upside down again in its curing place, re-cover it with the plastic, and give it a few weeks to sit quietly. At this point I turn it right side up and let it get rained on for a few more weeks, then it is ready to use. 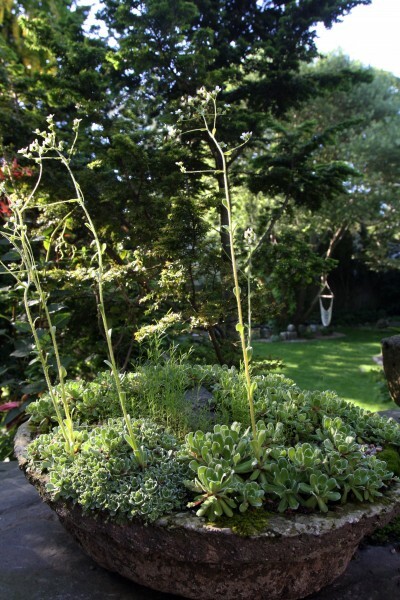 An exemplary article by Helen Dawson about making hypertufa containers, with images showing the details of the process, was recently presented by Fine Gardening (.com). The recommendations nearly match the recipes and procedures that I have used, except that I have not added fiberglass. I hope that you will look at her excellent instructions if you plan to do this yourself. The only additional details in method I might mention would be that I use type 2 Portland cement because it gives a deeper grey color, and I use less perlite and add some very course sand. This way I end up with fewer ‘white dots’ of perlite and so perhaps a more naturalistic appearance overall, but the sand adds a bit of weight to the structure. I like the walls to be at least 1 1/2″ thick, and in large containers, 2″ is good. When you cast upside down over a sand mold, it may also be nice if you can make a moat shape in a soft ‘base’ pad of sand where the lip of the container will be formed, so when you eventually turn it right side up, you will have a softly rounded rather than a flat upper edge on your container. I have made quite a few of these over time, but for the larger ones, I usually give the project over to a professional. Well constructed troughs and pots have typically lasted 15 years and more in my landscapes. In my experience, the most versatile troughs are 12 to 18″ wide and 20”+ long with an interior depth of 7” or more. 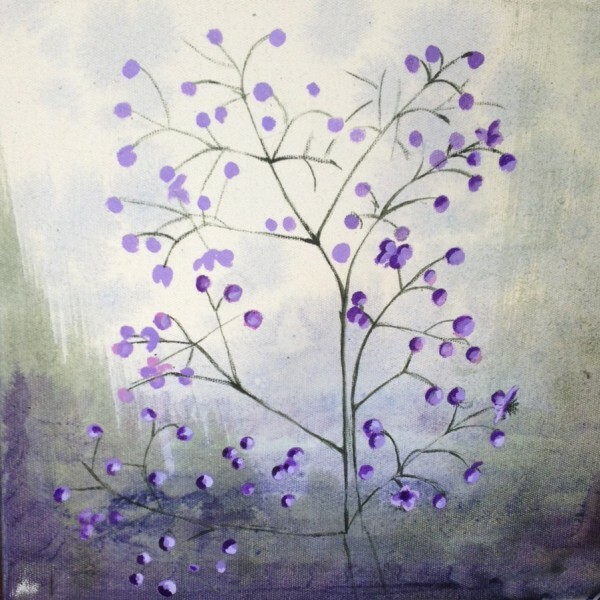 I find my most popular shapes are a foot or so wide and 20″ to 36″ long, probably because those sizes sit nicely on many commonly available surfaces. A rough minimum for sustaining perennial plants over time would be an interior depth of 6”, with a 10” width or diameter. Whether you choose perennials or annuals, good surface and bottom drainage will be essential. A fine ¼” stone mulch at the surface is often ideal. This also makes a receptive seedbed for your chosen things to seed into their home grounds. 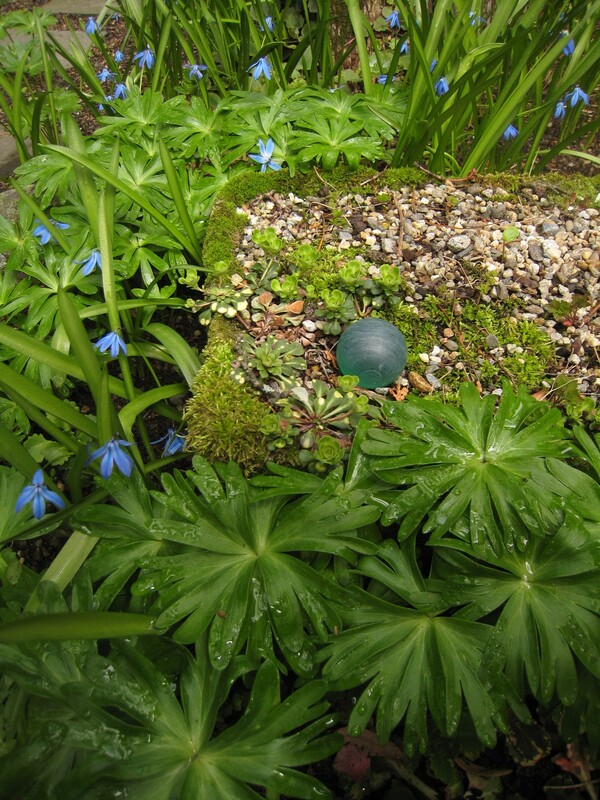 For Alpine plants, drainage is extremely important. 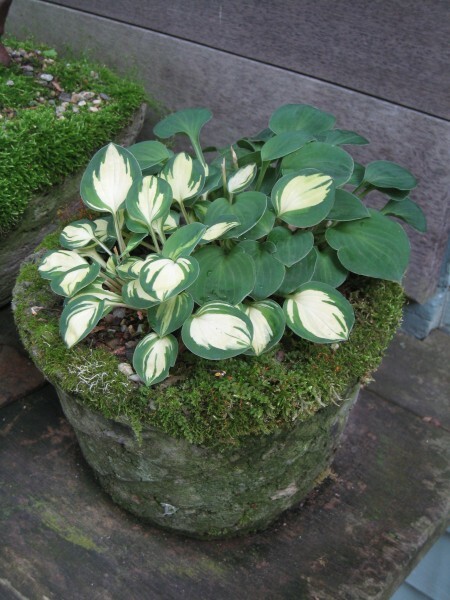 Many Alpine plants are preadapted to the settings these containers can provide, but often they can’t withstand wet crowns for long, and so must drain quickly when the snows or rains impinge. To this end, I embank the earth in the overall container so as to create a slope gently descending outward from the center . I sometimes use stones in a few places to support this banked presentation to the view. In general, more kinds of plants can be sustained through the winters in larger containers than in small ones. 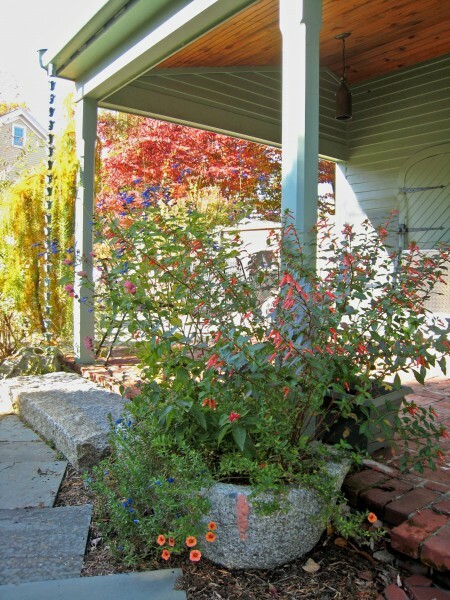 Wide and deep containers provide more earth around the plants, which seems to help cushion the extremes of our New England weather. For colonies of things, bigger is also better. It is just that there is more room for your various kinds of plants to develop gracefully into meaningful groups within your miniature gardens. 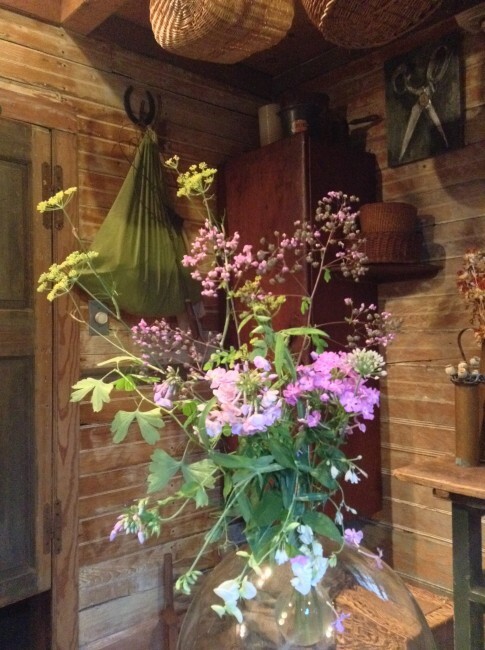 Whenever the container is big enough, it may be esthetically interesting to give it dominant and subsidiary plants, perhaps choosing ones that flower in various times of year, as you might if you were organising a larger landscape, just on a smaller scale.…. I always mix perlite and ¼” stone into the planting substrates to help keep the mix perpetually free draining. I add some compost and slow release fertiliser too. Depending on who you will be growing, what else you use in the container to make up your planting ‘earth’ can be adjusted somewhat. Some kinds like lean earth and others prefer theirs to be organically rich. When the plants are generalists, they are easily kept, and there is usually nothing very exact about the mixtures. This way you won’t disturb the colonies too much, and surface seeds will not be lost. 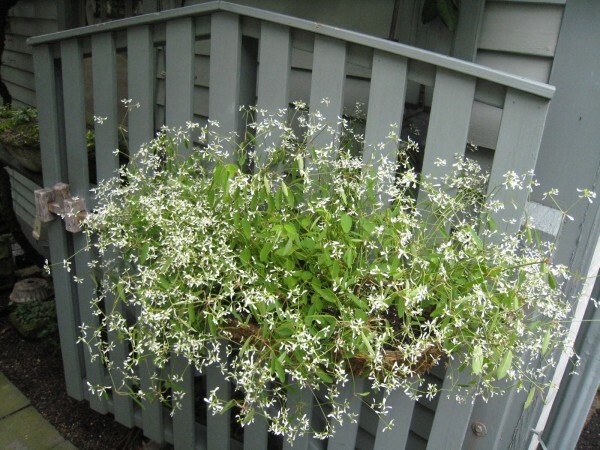 …..
For clues about the best substrate for your planter, you may want to Google your candidate Plants’ names to read about their original and preferred habitats. 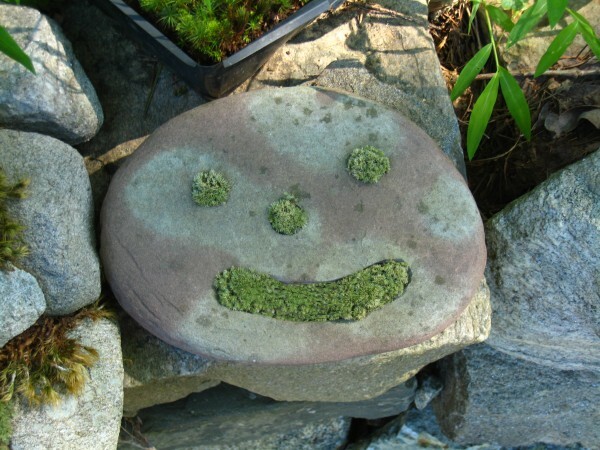 The North American Rock Garden Society has been helping people (including myself) to grow plants in rock gardens and troughs for a great many years. If you have alot of questions, you might want to join the Society. They have local chapters under whose auspices you can see and learn alot, and they will help you to locate plants that might be hard to find on your own. The level of knowledge within their membership is beyond amazing, and always has been. Certain particularly durable perennial things can easily manage through the winters in very small troughs or pots. 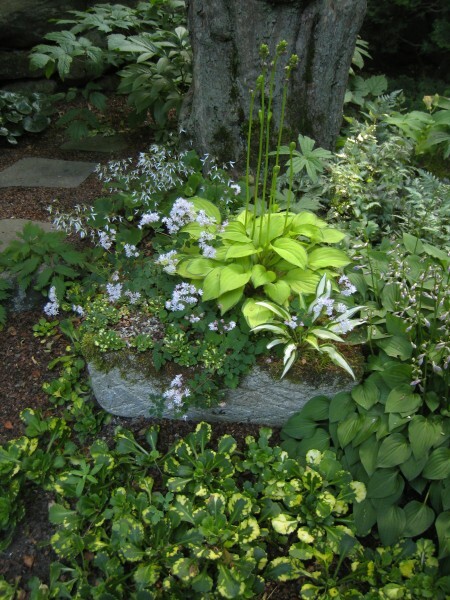 For example, most miniature Hostas are as easy to take care of and tough enough for just about anything. 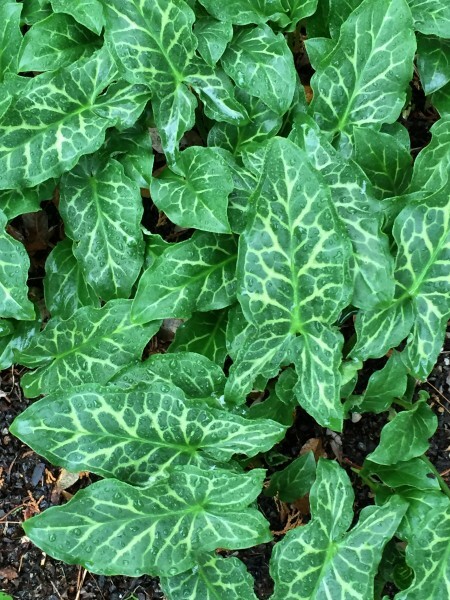 Like their full size Hosta relatives, as long as you avoid hot and sunny places and trim them twice a year, that’s that. There are lots of other easy care things that do very well. For a small or medium alpine trough with partial days of sun, the encrusted silver Saxifrages are very desirable. Many are beautiful, fully evergreen and fortunatelycertain kinds are also easy and reliable. Saxifraga callosa (lingulata), S. cotyledon and S. longifolia in variety have proved especially adaptable. Saxifraga apiculata, which is the first to bloom in spring, has returned here for 15 years. 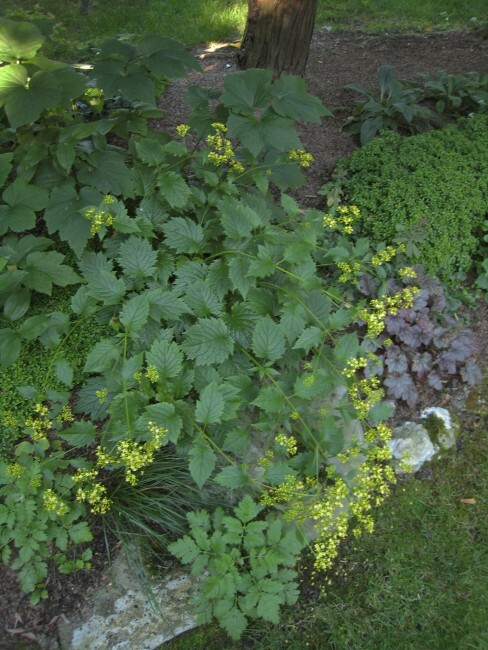 In shadier places, Saxifraga cuneifolia and S. umbrosa x urbium, in both their green and their yellow variegated forms, are particularly willing and able. Little containers can easily be moved to a wind protected place for the cold season, but I rarely find that I need to, if the occupants were chosen for their resiliency. The most important size consideration for the non-hardy decorative annual plants you choose may be that they are in scale with their container for good appearance. Nomatter what size of container they live in, most annuals will need some liquid fertiliser every couple of weeks. The ever flowering Corydalis lutea and C. lutea alba, the indefatiguable Kenilworth Ivy including a new pure white form, Cymbalaria alba compacta, Linaria Canon Went and the tiny Thalictrum kiusianum will be readily pleased in these semi sunny places, just to name a few of the easiest and longest blooming candidates. ….latives of the Japanese painted fern……. Although containers in hot sun are the most difficult to sustain, but even there, the simple but beautiful Hieracium pilosella will enthusiastically decorate a container forever, though often too aggressive for much companion planting. The flowers are modest but my, what lovely silvery foliage it has.. When you have just one or two of something special, keeping these ‘parent’ plants in troughs or other permanent containers allows them to be protected and watched over until the time when they begin to self sow or are divisible. If you locate a trough in a setting which has an inviting ecology for seeds, and you leave the ground around your container undisturbed, next year you may have babies appearing on their own. Many of the Zone 5 hardy annuals and perennials suggested in my articles will happily sow themselves in. After a couple of years, when you have quite a few of your chosen kind established, you can put some of them in the open garden and feel safe. You could decide to let only one beautiful kind of plant completely occupy a trough or pot, in which case the planting is a monoculture. With this method there is no risk of losing your unique kind of plant to other competing colonists. I keep a lot of very lovely containers this way, letting one particular kind of plant thrive and show well. These are perhaps the easiest kind of containers of all to manage. If there are multiple kinds of plants within a trough, without intervention, there will probably be winners and losers. As the mixed colonies develop, there will invariably need to be decisions about who has priority over whom. Certain plants can co-compete somewhat equally, but other types can easily lose their ‘ground’ to rootier or otherwise more vigorous things. If rambunctious plants land themselves in your troughs, you can’t let them stay or your other precious denizens can quickly be crowded out. For each trough I simply establish rules of who gets to stay and who will be subtracted, and then try to keep to them. To be a good gardener, one has to learn to be a bit ruthless. In winter, outlined in snow, the trough shapes show their sculptural qualities, and I treasure them for this too. They seem such protective places as I think of their sleeping inhabitants. A second purpose for the branches of Christmas trees and other holiday greens is to re-use them as decorative wreathing for your otherwise somewhat bare perennial beds, but the reason to use them is usually to help insulate plants residing in the earth beneath. I find this branch overlay technique especially useful wherever it can help to protect small or shallow rooted plants, often in the front and middle ground of the planted beds. The branches help to buffer the temperature ups and downs which cause the earth movement. I typically apply this protective layer to beds which get alot of sun in winter, where temperature changes tend to be rapid and so heaving is a frequent problem. Snow would do much of the job of protection by itself if there were a reliable covering of it through the freeze-thaw cycles, but in this part of New England you can’t count on a snow blanket.. Branches cut roughly 18″ to 48″ from Post-Christmas trees or wreathing materials can be used, whether yours or contributed by a neighbor. Waiting until this time of year to prune your evergreen trees or shrubs can provide useful cuttings too. 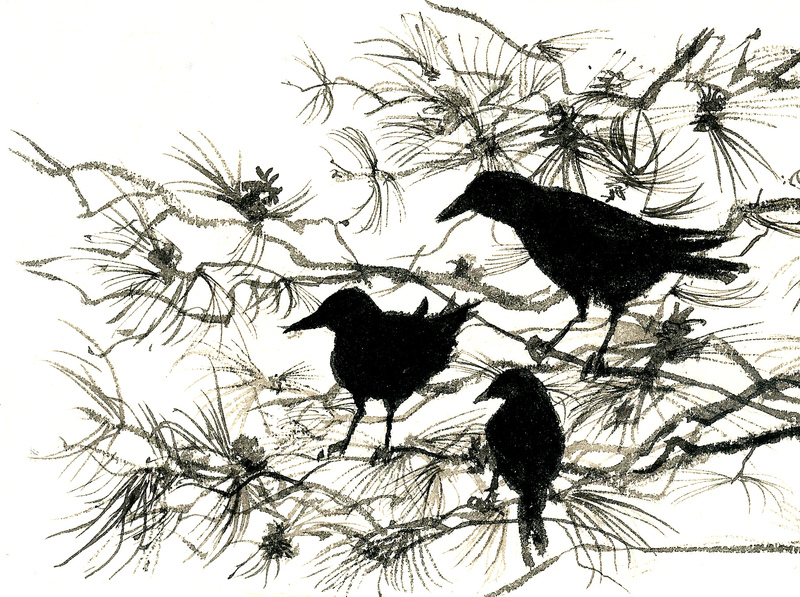 I weave the branches together by crisscrossing in an over and under way to help them resist being blown about by winter winds. These greens can be laid out along the edges of your perennial beds or wherever vulnerable plants are sleeping. Or One might choose to lay evergreen branches on some beds just to have them look wonderful through the winter. The insulation is most needed through the late winter thaws. It is just perfect that these lovely evergreen recycle materials are so readily available just after Christmas since the insulation this handsome wreathing can provide is most needed from January through March or so. Setting the branches out any earlier would not be better, since it is good for the plant materials to get a thorough soaking before the deep freezes set in. If there is some snow on the ground, you can wreathe right on top of it and as the snow melts, the branches will settle roughly where you wanted them. Adjust as needed. The evergreen boughs protect the plants in much the same way that hay would, if it would stay put. 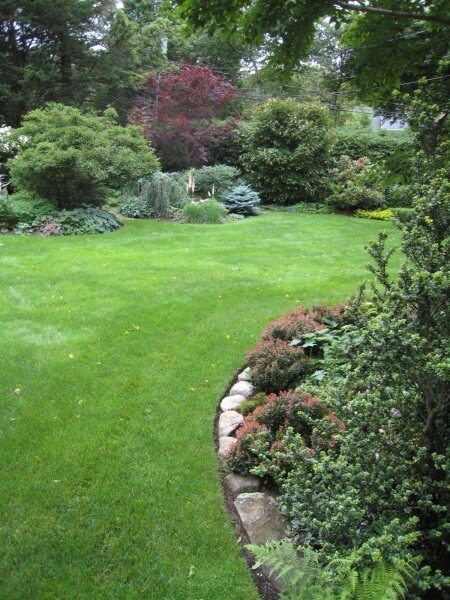 The difference is that you will have green beauty through most of the winter, and a much easier cleanup in spring. Even if you have done your best to protect your plants, whenever there is a substantial thaw, you may want to scout around a bit and see if any plants have been heaved up out of the ground. Locations that get alot of winter sun can thaw out surprisingly quickly. When they do, the the ground may pop up precipitously and the roots of newly established and shallow rooted plants may be lifted up too. With their roots exposed, they could easily be killed by the next cold snap. Quickly you need to press the individual plants back down into the earth while it is still soft, before it gets cold again and the ground closes out their roots..
delicate plants in places where the winter sun hits heavily. In Britain, winter protection is sometimes conferred by sheaves of cut deciduous branches, with the charming name of ‘twig thatch’. In their famously beautiful and lovingly tended North Hill Gardens, to soften some of the harsh aspects of the climate of Vermont, Joe Eck and Wayne Winterrowd have used cut Miscanthus bundles from their own stands of these grasses. They are laid out as needed before winter to protectively insulate the fruit trees** who also live within their ecotome. * Don’t use limbs if the needles have begun to dry out. The fresher or moister the better. Firs and other soft greens will be the most pleasant materials to handle. Short needled Pine and Hemlock branches don’t last as well as most other evergreen things. In our northern landscapes, attending to the winter appearance of a place is a priority since what we see changes dramatically when many of our plants drop their leaves or disappear entirely through a long cold season. Unless you plan in some winter pictures, this can leave an empty feeling in the experience of your outdoors. you will see and experience in your all year views. Begin by choosing the placement of ever seen elements. The buildings, stone and masonry, fences, tree and shrub outlines, furnishings and earth contours – along with your evergreen plant materials – are ever seen parts of your landscape. Their all year visibility means they are always important, making up the framing on which your all year views depend. Such things should be considered in the first round of design thoughts to allocate the best possible locations and configurations for them. The evergreens and other ever seen things should make beautiful pictures alone. In the simplified compositions of winter, the evergreenery and ever seen things will be experienced as a group. 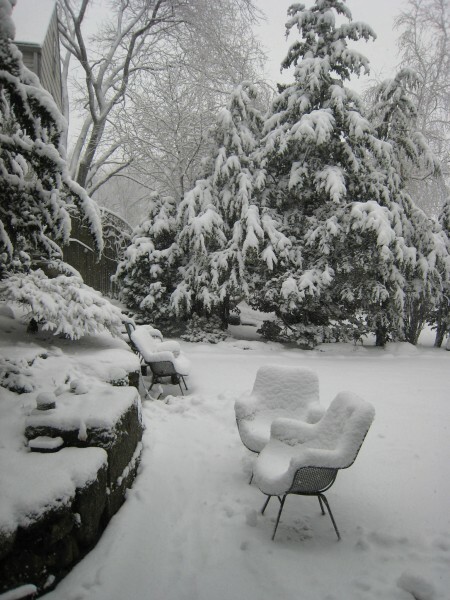 You can arrange for complete and satisfying pictures by considering these elements together, thinking of your winter garden as a somewhat separate landscape, while carefully designing plenty of in-between places for the plants of other seasons. to add or subtract for your future cold seasons. Put some Evergreens in the Background and some in the Foreground. 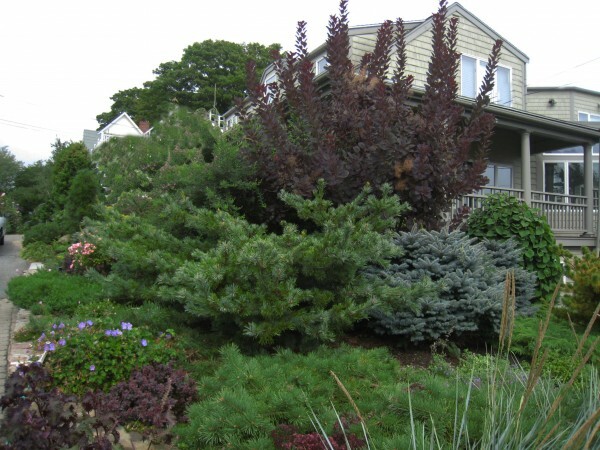 With important roles in all seasons, the sizes and shapes of evergreens are key design choices. 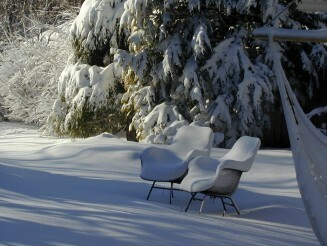 Their outlines and density can give body and shape to the winter scene, taking prominence in your cold season views. You will probably want some in the backgrounds, mid grounds and foregrounds. Well shaped spaces you create between the winter elements provide in-between places for your warm season plant materials. 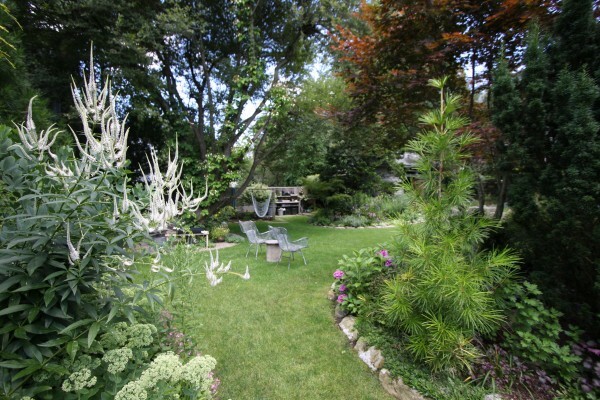 When the contextual frame always looks good, it is much easier to organise lovely gardens for the warm season plants. A handsome evergreen context lends itself easily to satisfying combinations. For the warm season pictures, all the evergreens can serve as backgrounds, frames or surroundings for deciduous trees, shrubs and colonies of flowering plants. 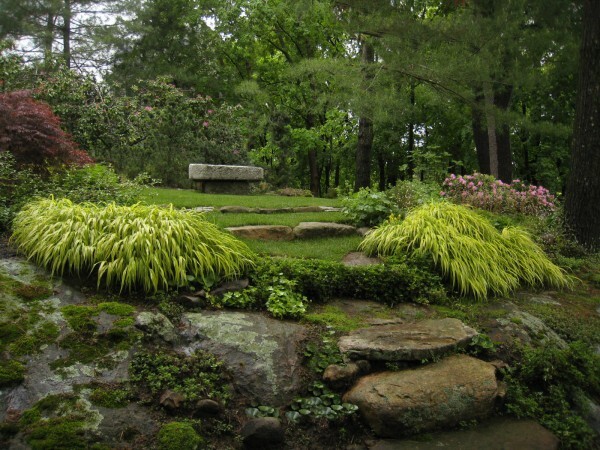 Click here for other articles about Shaping the Landscape. Positive and Negative spaces must both have pleasing shapes. Positive spaces are the ones being considered at the time. The surrounding forms are the negative spaces, the secondary shapes that result. Both of them matter. Each shape you make by design should accommodate and enhance the reciprocal shapes it creates. When you begin thinking about the negative spaces, they can become the positive spaces at that point in your thoughts, shaped respectfully with their adjoining forms to optimise both. “When negative and positive spaces are reversible no space is wasted. The framing of your planted compositions might be the floor. For pictures we see from above, the floor layer becomes the background and frame of our view, and can unify the picture. 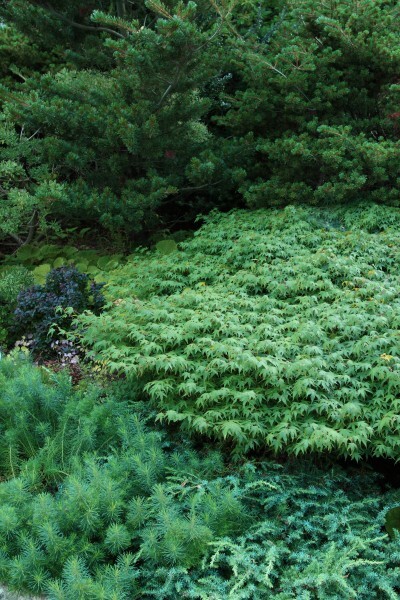 The carpeting effect of many evergreen groundcovers together is satisfying year round. Also pleasing is that in earliest spring, woodland plants and small bulbs can emerge between and through green blankets instead of brown ground. Don’t make the Backgrounds of your planting places too Busy. Backgrounds should be simple enough to flatter what will be seen against them. If there is too much diversity in the background, whether plant materials or built structures, the things in front may not show well. Every foreground element benefits from a considered background, and vice versa. Consider your structure colors in relation to the things that will be seen against them. You will often want some contrast between the elements seen together in a view so as to perceive each at its best. 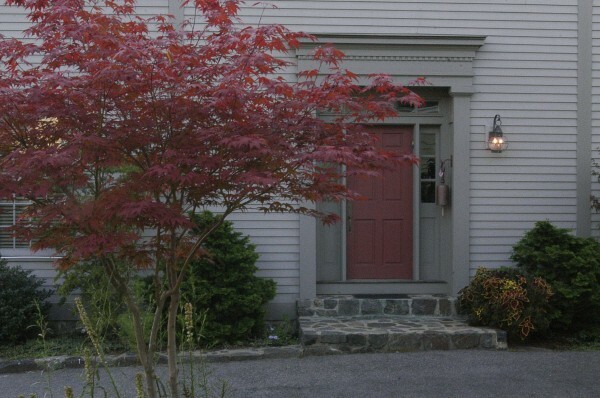 Red foliage will show better against weathered grey wood than the red barn. Green houses are often the wrong green when seen close to the true greens of nature, and green on green can get visually muddled. ‘Something dark, Something light, .. Alternating heavy foliage and fine, putting light leaves against dark ones, glossy against matte, each enhancing the other through contrast, is a simple strategy which can be planned in to add interest. Textural variety in plants allows the same lighting to have various effects on the picture. Evergreen foliage comes in a fantastic range of textures, matte to glossy, corrugated to velvety. There are varying leaf shapes and sizes running from tiny to huge. Each type reflects or absorbs light in its own way at any given moment in time. The enhancing effect of thoughtful combinations is something you can orchestrate. Don’t use too many strikingly different plants all together in a view. When you choose the plant materials for a given landscape picture, you will be looking for pleasing groups with respect to colors, forms and textures. Your elements, whether planted or built, should be beautiful with their particular surroundings as well as by their individual character. Strongly divergent plant personalities may work best with some degrees of separation, in different views perhaps. Click here for more of my articles concerning Views. If you use too many different diverse plants or colors all together your place may look more like a garden center than a composed garden. As with most things, the number of pleasing solutions is outnumbered by the possible displeasing ones. Some combinations are more compatible than others. Among the many beautiful conifers and broadleaf plant materials available, the foliage may have bright or soft yellows, greys, blue greens, purples, mahogany, magenta, lavender or pink tones. We don’t have to use them all together to have them. Many pleasing groupings can be made by using evergreen color forms in considered combinations. Use alternate color family associations in separate pictures. If you bring together things that have suitable ecological preferences and complementary forms and colors, you can organize these in a given view, but remember that you don’t need to use all of the possibilities in a given view. Alternative color groups of companionable sociations can be used in separate views. This is the most reliable solution for harmonies if you want to use alot of colors and kinds overall on your property. Evergreen hues you select for a part of your garden will need to complement the colors of the warm season plants in that place. Plan in pleasing winter surprises. turned up here and there. The name of this kind is Porcelain Doll. seems to have its own personality. which gave her an iridescent look. Acorn Squash, and this one tastes nice too. and carefully grew its offspring. Now there are enough that we can all enjoy them. a percentage of their earnings to support Breast Cancer Research. if you want to start your own Patch for next year. If you want to grow them, you can send a note to hello@pinkpumpkinpatch.org. are quickly developing a wide distribution. Your purchase encourages and supports the grower. The growers in turn are supporting the Foundation. 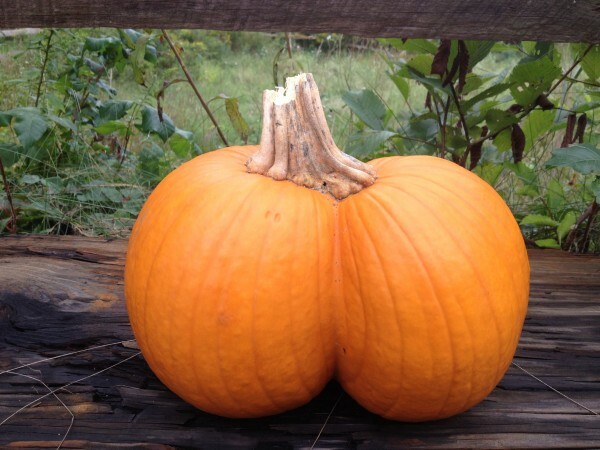 these pumpkins have a vibrant orange interior. 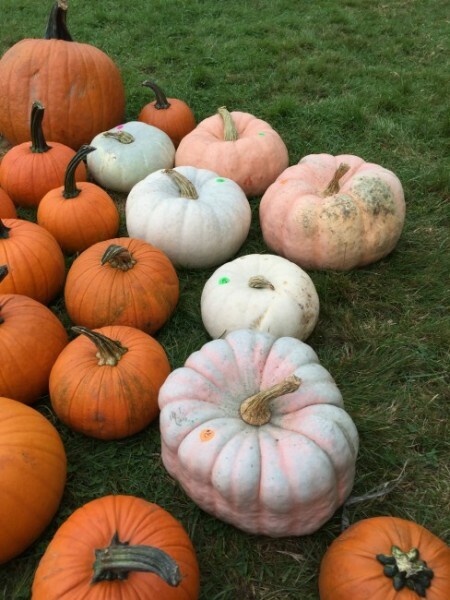 It is shown here with brown stem pumpkins so you can see the difference. In general, people call to mind most easily those things that have happened most recently. Each year, the last plants to flower in a freshly beautiful way seem very precious. In fond memory, they seem to stay close by as we go through the grey and white seasons. Actually anything that we, as gardeners, can do to make the winter feel shorter will probably feel good. Having some of the latest and the earliest flowering plants of all kinds and sizes in the tree, shrub, perennial and wildling departments helps alot. 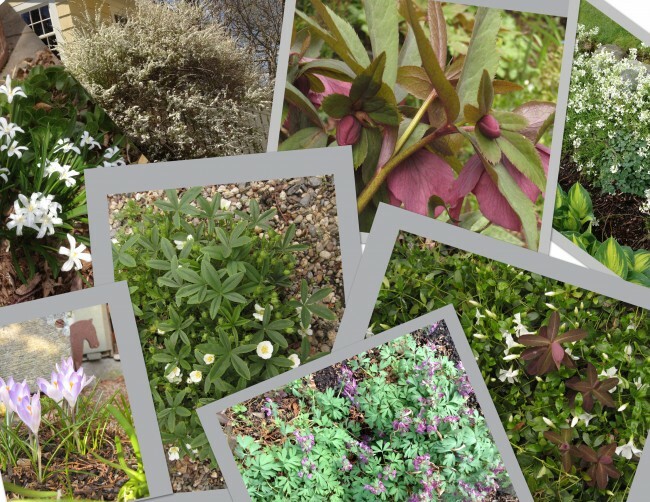 Most months of the year in Zone 5b can have some plants naturally flowering – or otherwise looking fabulous – if you just choose the right plants. 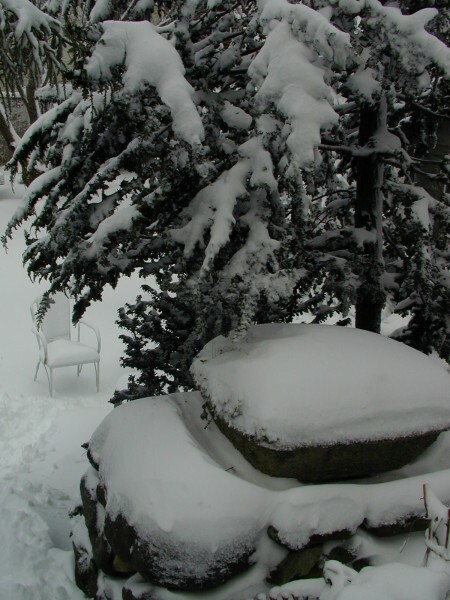 Thoughtfully Shaping the Evergreen Landscape for satisfying winter pictures helps too. This wonderful plant blooms continuously in diminishing degrees of fullness from Memorial Day into September, even carrying a flower here and there until frost. Throughout the summer season, red berry clusters ornament the branches wherever it has flowered. Look quickly though, you may not have much time to enjoy the beauty of those berries since the birds and squirrels will take most every cluster, once they decide they are just right. Delicious, apparently. 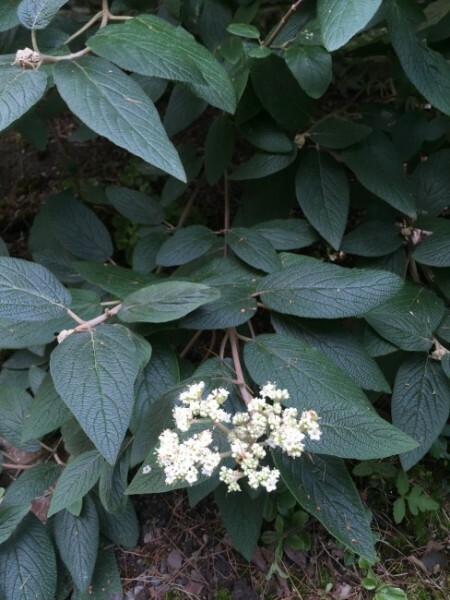 This Viburnum likes a woodland edge situation, with at least a half day of sun, and 2/3+ is better. While often presented as a small and slow growing thing, in my experience it matures fairly quickly in a good exposure and a small specimen can grow into the 12’ height range after 6 years or so. While it can accept a shadier situation, it won’t flower as much and grows more slowly. 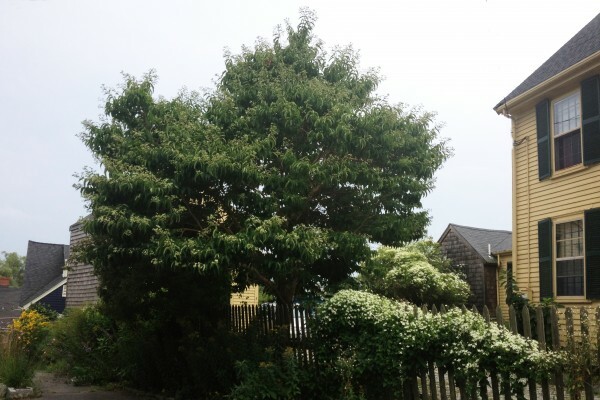 Although Viburnums are thought of as shrubs, not trees, this one tends to have a nice shape on its own without much trimming. It can easily have the appearance of a small and well-formed pyramidal tree if you start it young and keep it to a single trunk. The white flower highlights may be enhanced in a view including other plants with white in leaves or flowers. Allocate some width for its future, 10’ on center perhaps, as it has a graceful architecture when its limbs are given some radial freedom. You can prune it up later and treat it as a canopy tree as it matures. It is rarely troubled by pests and has proved solidly hardy here in zone 5b for 13 years. Another handsome and reliable Viburnum is V. rhytidophylloides willowwood, shown above, which often flowers here in fall and also in spring. The flowers are, however, a modest attribute compared to the handsome glossy, corrugated foliage which is particularly since it is evergreen through most winters in zone 5B. It is especially useful because it can be grown in modest light conditions, and we all have our shady spots. It is somewhat drough tolerant and competes well even in rooty surroundings. Although a shrub, it attains a tree type height and stature, with the advantage of keeping its leaves at the bottom as well, if you want it to. Or prune to taste. Daphne t. summer ice is somewhat new to the trade, but destined to be a centerpiece wherever it is grown, a truly beloved plant. She has proved very reliably hardy in zone 5B for 6 years. This Daphne is somewhat similar to the familiar Daphne Carol Mackie, the beautifully variegated form that many gardeners know and love, just with less ivory variegation on the leaves. 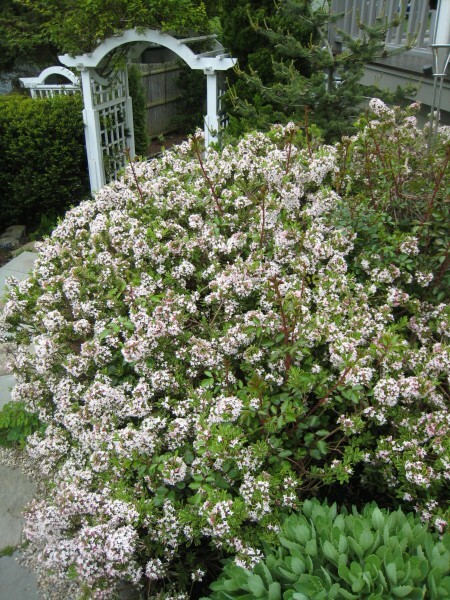 The difference between them that matters so much is that Daphne summer ice produces fragrant flowers continuously and abundantly throughout the entire summer and into late fall. While D. Carol Mackie has an extravagant and fragrant flowering time in May for a few weeks, there will be no more flowers until next year, though her leaves contribute beautifully in the garden until hard frost. Daphne summer ice is more floriferous and sturdier here, hardiness-wise, than the green leaved, reblooming Daphne transatlantica and D. caucasica forms I have so far tried. All the aforementioned Daphnes are semi-evergreen to one degree or another, so their leaves will please you even as the early frosts come in. These Daphnes need a good amount of sun but not too hot of a place. With some wind protection, adequate water and drainage they will please you for many years to come. It seems to be the natural habit of all of these Daphnes to want to lean and drape, so find a spot where that will be ok with you. When you choose a place for a Daphne, choose carefully because they do not transplant well. For all of these Daphnes I would choose a specimen with a sensible volume of roots. Very small young ones have shown a dismaying failure rate when transplanted to open ground. A bit bigger and older is better to avoid problems in this crucial matter, but if they get much older and fuller and reach 2 feet or more in height and girth, they may have adjustment problems in a new home, perhaps from having lived a long while elsewhere. Heptacodium micionoides flowers wonderfully late in the garden. 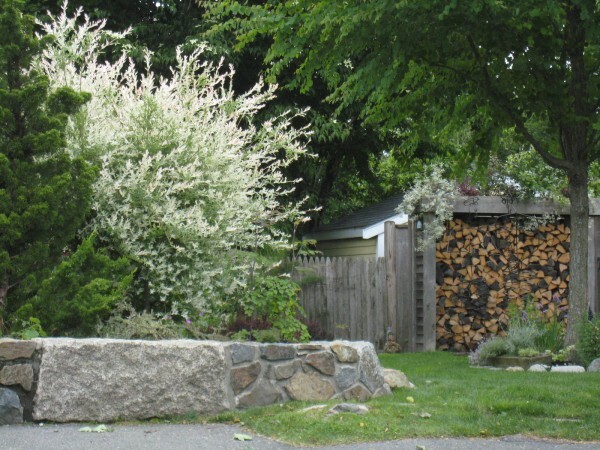 In early September or so in Marblehead, it will be freshly covered with white panicles of flowers that last many weeks. 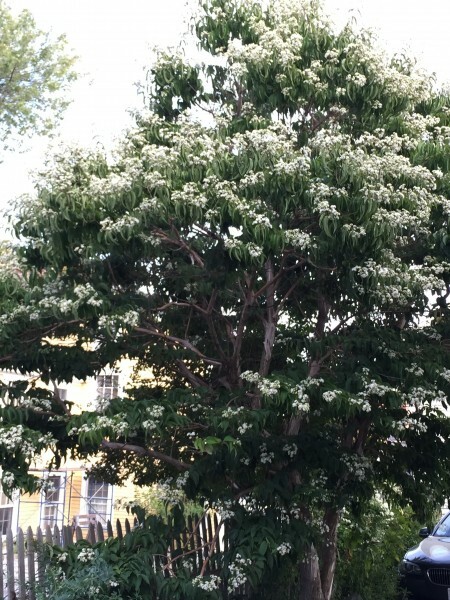 These myriads of blossoms emit a subtle intoxicating aroma, pleasing to both pollinators and people. Their silvery exfoliating bark is an attribute through all the seasons. After flowering, the pink calyces stay behind (originally the sepals of the flowers), and these miniature bouquets redecorate the whole shrub / tree with a rosy glow. 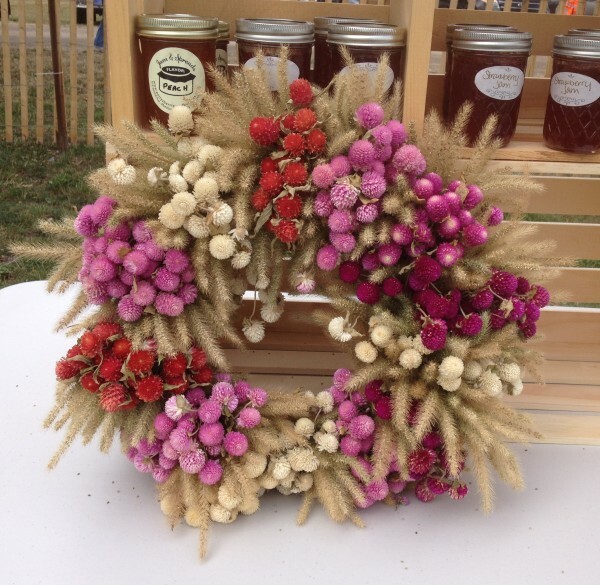 I harvest some of them and let them dry for winter indoor arrangements. A bowlful is lovely to have. The greatest challenge is the pruning of Heptacodium for good shape, since her branches go eagerly in many directions. 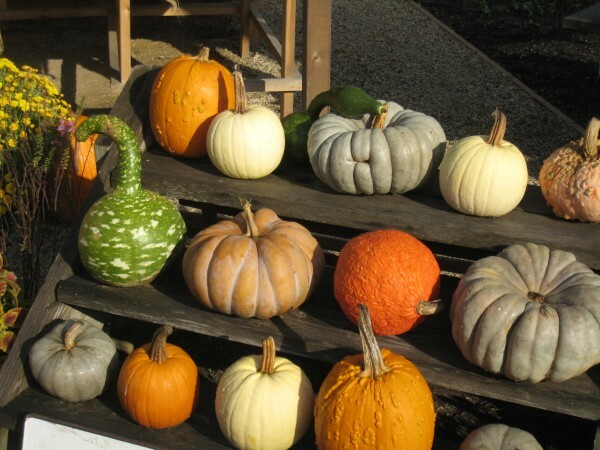 You need to decide which ones have good shape, leave them and ruthlessly prune off the odd ones. Without such attentions, her overall look can be awkward. One of the latest glories of the garden, there is little else as exciting as Lespedeza gibraltar at this time of year when her fountainous form will be covered with deep pink flowers. Lespedeza – sometimes referred to as the ‘lets be friends’ plant, since it’s a tough name to remember – is invisible through the winter and spring, and develops modestly through the summer, so she takes up virtually no room in the garden, though she is preparing for spectacular glory in the fall. Sometime before winter, the ritual is to cut her back to a nubbin some inches high and she will start all over next year. In this way, it will be out of the way of other plants until next midsummer when its drama will begin again, from the ground up. The white form, Lespedeza avalanche, is even a bit later, and gives us flowers in October. Equally hardy and beautiful, it is especially easy to site because white is so versatile. Both of these Lespedezas prefer quite alot of sun, but can be rewarding in places that only have a 2/3 day exposure, they will just lean towards the light, but you can plan for that. 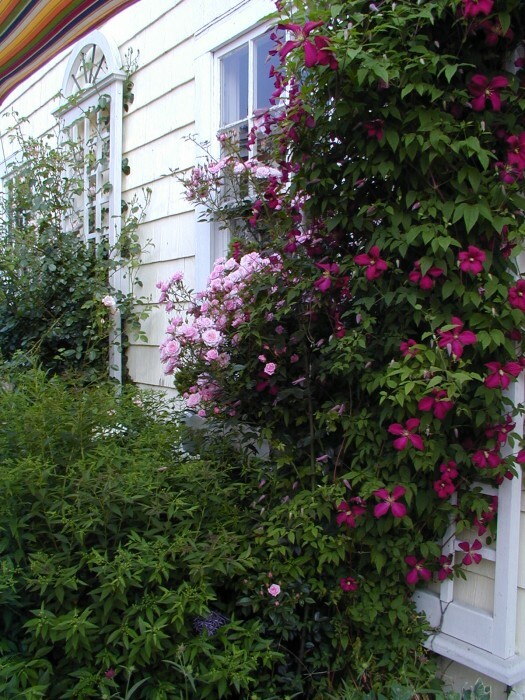 I tie mine up on an arch where earlier in the season, the place was adorned by Daphne Carol Mackie, then miniature climbing Rose Jeanne la Joie and Clematis Julia Correvon, and they all live quite happily together. The cut down system is very convenient in a small garden where the fountainous excesses of Lespedeza’s leaves and flowers wait to shoot up until after the understory plants have finished flowering, so you can have earlier things sharing the same places as these lovely late ones. So long flowering and sturdy that, though a vine and not a true shrub, I wanted to link you to things I have written about this Lonicera’s stellar late performance. There are quite a few more favorite late flowering shrubs that I will write about later, along with a raft of the best Late Flowering Perennials and self sowing Annuals. One or All of Them …….. Many of the longest blooming Clematis are found among the smaller flowered kinds. Their myriads of small individual flowers combine to make as exciting a show as any of the large flowered Clematis can offer. I find that their stems and foliage also last more nicely and can be managed more neatly in the garden than is typical among most larger flowered forms. These details of behavior and appearance are particularly important in gardens that are enjoyed from close up. Long blooming plants are very desirable in small gardens where the number of plants you can have is limited by the space available, and foliage quality matters alot too. The siting of all Clematis should take into account their not very lovely ankles. Some sort of a nice looking skirting plant located in front of the climbing place will be helpful in this matter. This is to provide a façade for the least lovely parts of your otherwise beautiful vine, and not usually for the Clematis to climb onto. 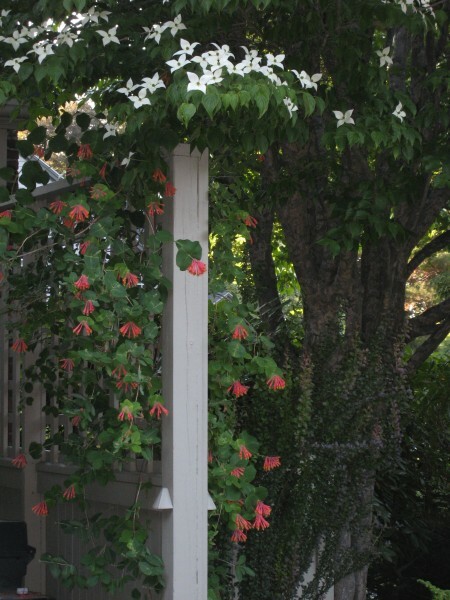 Clematis prefer a somewhat shady base, but sun on the flowering parts, so a skirt helps in this. You need to allow some bed width in anticipation of esthetically needing a skirting partner. The support system is a different matter. 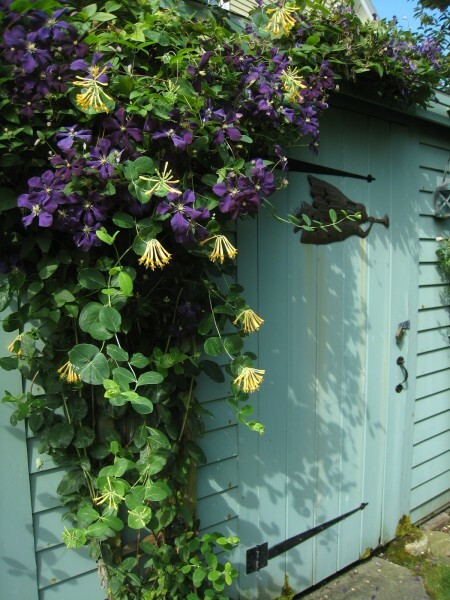 Whatever support you use, whether living or constructed, you will have to tie your Clematis up a bit every week in the growing season, but you will always get a very generous reward. She starts blooming in mid June here and continues, in profusion, long after most of her close kindred have gone green again, with some flowers until September. Each additional year in the ground here has corresponded to an increased length of time that Betty remains in flower. From the 5th year of her residence, she has covered herself with flowers for three months. It is said that Betty doesn’t get the ‘Wilt’ that can spoil many kinds of Clematis. She is certainly extremely resistant, as I have had the ‘Wilt’ trouble with other Clematis, including some small flowered forms, but never Betty in 14 years of growing her. The original Betty Corning was the wife of Erastus Corning II, mayor of Albany NY. His father, Erastus Corning the First, was a New York businessman after whom the city of Corning, NY was named, the Corning Glassware Company being such an important business there. In addition to being an aristocrat, Betty Corning was a passionate gardener. The story is told that one day Mrs. Corning was walking through a steelworkers’ neighborhood and saw a Clematis that was completely unknown to her. It was truly outstanding; an extremely vigorous vine with beautifully shaped fragrant lavender flowers. 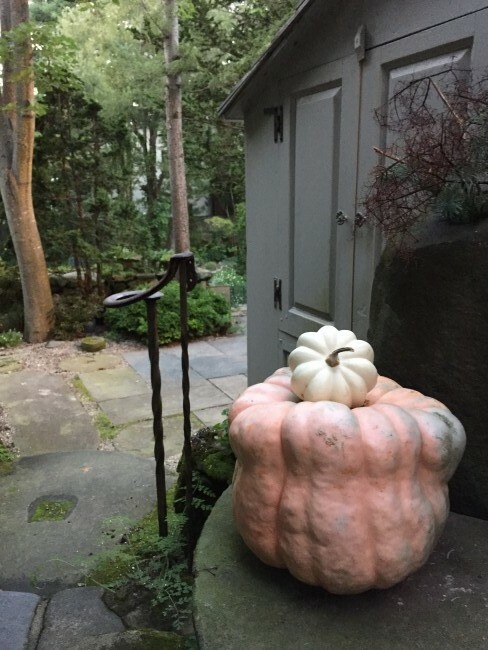 She knocked on the door and asked about it; the lady of the house said she’d received it from an aunt, “rooted in a potato.” The last detail is rather unlikely, but whatever its origins, Betty Corning asked if she could take a cutting. The lady obliged, and Betty nurtured the cutting and began to propagate it. Several years later when she was in the same area again, she went back to ask for some more cuttings, only to find that the entire neighborhood had been razed for new development. Knowing the story also helps one remember Clematis Betty’s last name, as Corning Glass comes easily to mind. The plant was named and distributed in the 1930s. This story comes to us through Steve Antonow, a Seattle gardener, as recorded on Kiporos Blog. 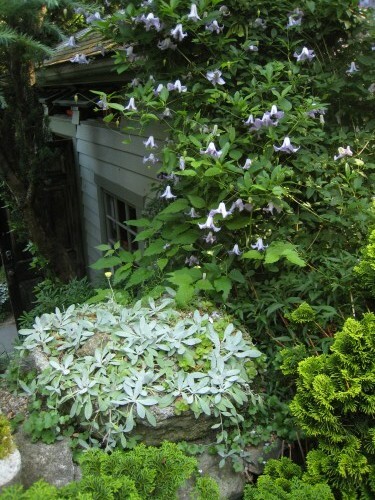 Betty overlaps her flowering time with Clematis Crispa, who is extremely long blooming too. Betty is thought to be a hybrid between Clematis Crispa and a Viticella, and luckily Betty seems to have gotten all the genes encouraging a long blooming season. Also called the marsh or swamp Clematis, this vine is extremely long blooming and graceful. Her small crimped and serrated bells are each perfectly lovely. It is a great thing to bring a vine to maturity, since if you can do this, your crispa will be decorated with these perfect bells for ages each summer, ever afterwards. Her heritage is from moist places, and so predictably this vine prefers such an ecology. She also needs a lot of space and sun on the flowering parts. You could choose to have more than one of these as there are color variants from lavender to nearly white, with some bluer and pinker ones inbetween. I have never met one who wasn’t exquisite in its flowers. Over time these do have some babies by seed, which may be considered a good or a bad quality, depending on the context. This wonderful vine glows with wine red flowers from early July until September. Very vigorous as well as free flowering, she needs plenty of room to spread out horizontally and vertically. As long as she is well supported in her continuing climb, and has space and sun enough for new flowers, she keeps going for three months. Though she has Viticella blood, her flowers are open faced and quite large (3-5”w) and so make a very substantial impact even at a distance with their rich coloring. Julia originated in 1900 from a Francisque Morel cross between C. viticella ‘Rubra grandiflora’ with C. ‘Ville de Lyon’ (with C. texensis lineage). Lost to the trade entirely at the time of World War 1, thankfully it was restored to the English market from a single specimen at Hidcote Manor, in Gloucestershire, and given back its correct name in 1972. 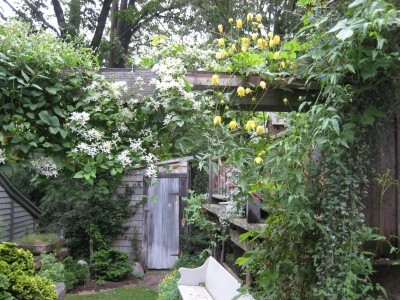 This lovely Clematis flowers with sunny yellow lanterns all along the top of my wooden arch. This structure is the braced frame built originally to carry the children’s swing and trapeze, but now it supports Clematis climbing up from each side, marrying with one another along the top. Before blooming C. Tangutica has lovely buds you can admire while you wait for it to bloom in early July. After some three to five years in a good place she will typically flower for two months, through July and August, and partially rebloom in September. This variety has the loveliest seed clusters of any Clematis I have ever met, and so even after flowering, remains so beautiful for a while that I am reluctant to do anything but lightly trim her. The late rebloom of C. Tangutica often allows her delicate yellow lanterns to accompany the pearly bud clusters and fresh panicles of white flowers of C. paniculata with whom she interweaves at the top of my arch. As the C. Tangutica display ends, Paniculata takes over the starring Clematis role. Shown climbing the left side of the arch with tangutica, C. paniculata is dressed in her white buds and blossoms by the tail end of August, then for 2 ½ months or more. 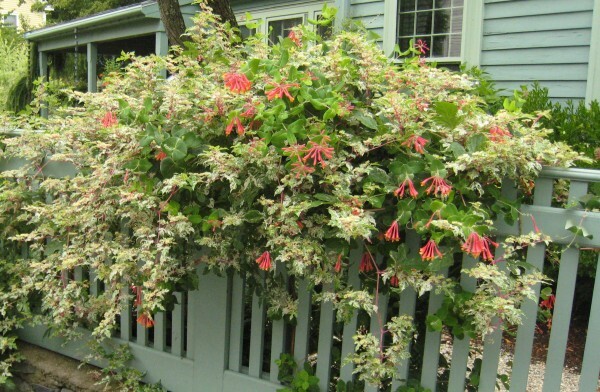 Lovely in leaf throughout the garden year, once her roots have had a few years to establish, she will be effervescent in white panicles She refreshes the 20 feet of space over which she reigns, at a time of the year when few other perennial plants are providing nascent beauty. 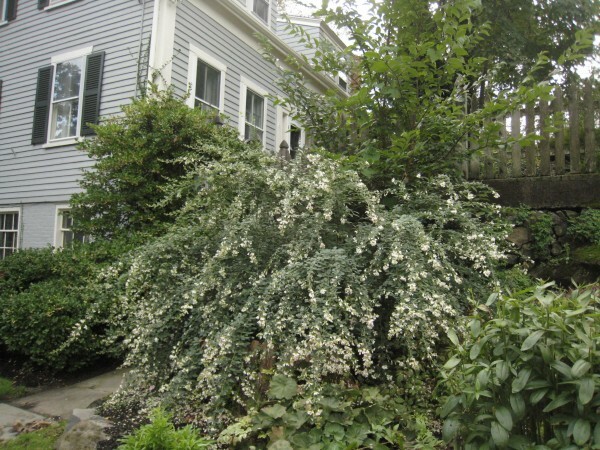 Clematis paniculata will have occasional flowers until it so cold that you must cut her down soon or let her be decorated for the winter in true snow white. Which is fine, if you like the effect. Just trim her down before April or so. 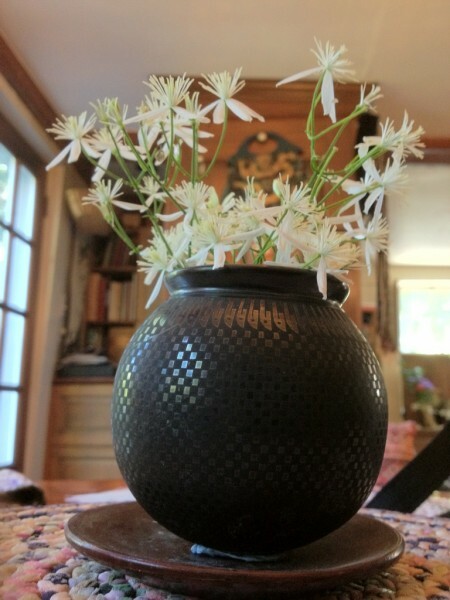 Though belonging to the large flowered group of Clematis, Jackmanii and some of its near relatives are fantastically long blooming after some seasons of establishment. These, while very satisfying in their blooming habit, have stems and foliage which I find are less easily kept attractive through the growing season than those of the small flowering types. Most people leave some old wood through the winter on large flowered Clematis vines as they flower the next year on both old and new stems. 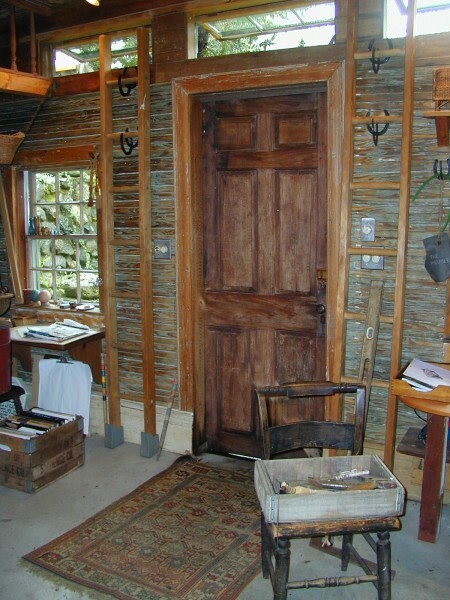 I have found the need to retain old wood is sometimes a hindrance in the esthetic maintenance of space limited gardens, and so I more usually use small flowered long blooming types that thrive on being cut down to 12″. If you have a large property, this may not matter as much to you. Perhaps you can have very many kinds, keeping the easily trimmed ones close by and the trickier ones at a distance. If anyone says that the Clematis don’t harm the things they climb on, I would ask you to be skeptical, and careful in your choice of climbees. If the shape of the supporting plant character matters to you, and it is a kind that does not spring new wood from the interior readily or is slow to replenish lost parts, you may be sorry to lose the branches that your Clematis could inadvertantly damage. Whether large or small flowered, and even if the Clematis is a kind that is cut down close to the ground each year, the shade and weight added in the growing season can cause problems for limbs of its supporting companion. 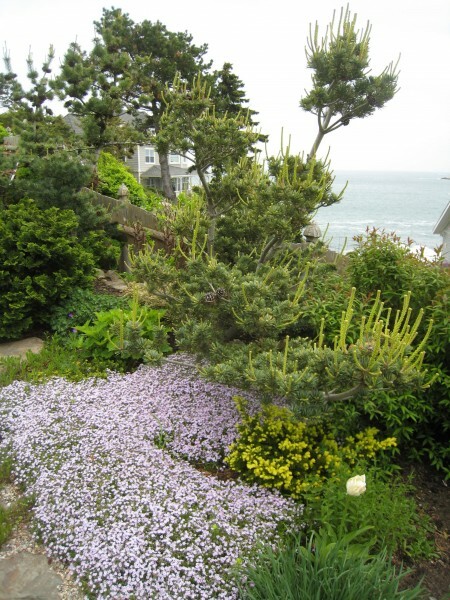 Shrubby plants whose individual branches are unimportant to their overall good appearance can be good choices as climbees. I would try for a well grown specimen before asking it to support a Clematis companion. If you want something which is evergreen, Yews are a very good choice for support because if any portion of their wood is harmed it will soon be replenished by new growth from a nearby shoot, even, as needed, from within its interior structure. Not many evergreens can do this trick well. Because of the different soil needs of Yews and Clematis, the vine should be physically planted so its crown is at a bit of a distance from the Yew so as not to be affected by any local treatment of the soil meant for acid loving things. Over time you may want to give your evergreens some Hollytone™ or other acidifying agent, and your Clematis won’t like that if it’s close by or downhill. To keep my Clematis going as long as possible at a height I can manage and enjoy, I may wrap the Clematis tendrils around and around things that are in their climbing paths. 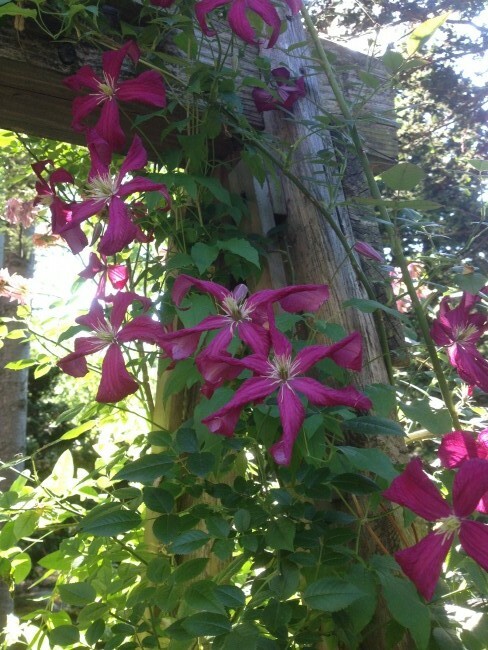 The Clematis discussed herein seem inclined to flower longer and better if the vine can keep growing along. A support system like a trellis or wire system is needed for vertical climbs, and wraparounds are a space saving way to keep them recurrently flowering in the horizontal plane. One can wrap around any artifacts placed in their paths to keep them elongating. This wrapping works nicely, for instance, around the bases of the planted tufa containers residing at the tops of stone walls. Well supported or encouragingly wrapped, most all of the Clematis do their best work when tied and tended. Revised from an article of the same title I published in 2010. If you have a few hours of good sun somewhere, this beautiful and tough plant will return each year, bringing in Hummingbirds for the festivities. It will give you its amazing display for quite a while, and if you trim it after flowering, rebloom some as the season progresses. 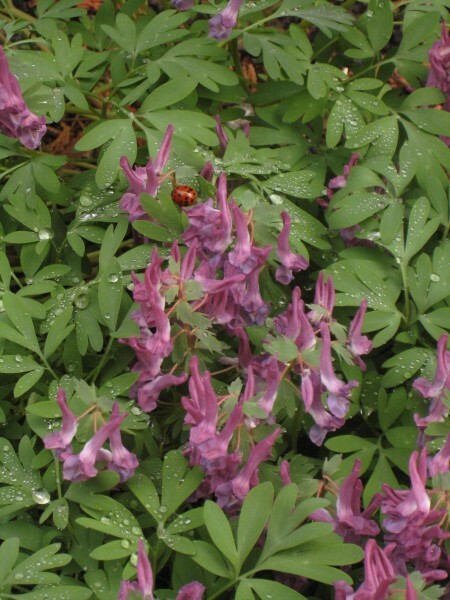 In zone 5B it fortuitously flowers around the Fourth of July, is fully hardy and reliable, likes a sunny place, is fine in a moist place, and even happy in a typically drier spot, once established. This plant is neat in its habit, and takes up only a couple of feet in width and height and so is quite easy to site, spreading gradually from the crown. The only potential problem is the color. You just want to choose its place carefully. 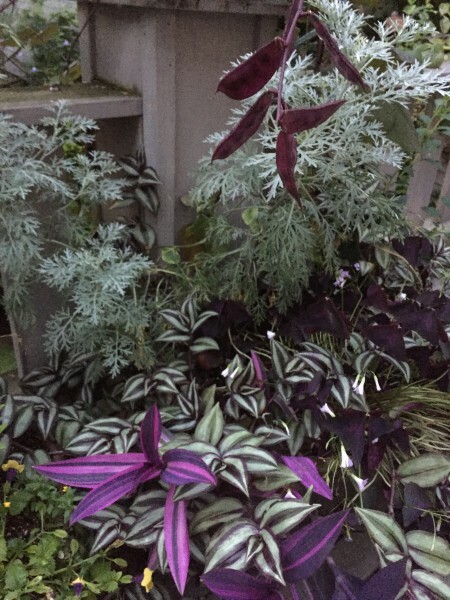 If you have nearby plants with pinks and jewel tones or reds with blue in them, there may be color conflicts. 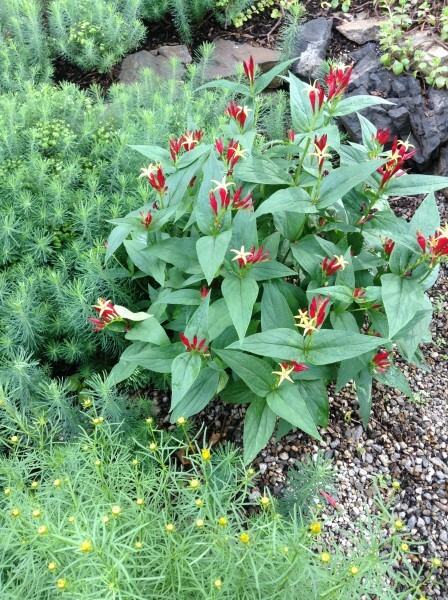 Spigelia is, on the other hand, seriously great with light yellow, true oranges, orangey reds or any backdrop of green. In the photo above, it is shown with Coreopsis moonbeam and the fluffy green of Euphorbia cyparissias. The Lonicera dropmore scarlet shown below can be a good companion with its complementary orange, and this long blooming vine is typically fabulous before 7/4 and on through summer and early fall. You can lead the eye wherever you want to. Make whatever you add complementary to what you already like and will be keeping in the place. Plan to erase whatever does not please you. 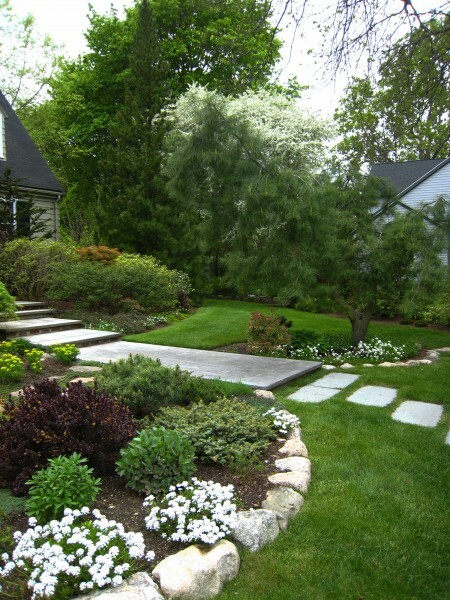 Through your design, you will want to show the virtues and hide the defects of your landscape situation. Often the farthest away places of a property are important starting points in the design thought process. Determining where you can create your best focal places and destinations can guide the heights and breadths, shaping and relational placement of built and planted features. A strong vertical feature, such as a tree, structure or any individual element, can create a clear dominant focus, making a comfortable beginning place for your thoughts on the design of the surrounding areas. This applies in every scale, from grand vistas to planted troughs. The vertical point does NOT have to be in the middle. It is often better somewhat off center unless the design is formally symmetrical. People seem to like to know where to begin and complete their visual experiences, where to rest their viewing and thoughts. By designing your views, you will organise the experience of viewing for yourself and others who experience the place. You need both dominant and subsidiary shapes. If you have more than one principal dominant in a view, the various things of equal strength will compete for your attention all at once and so create a restless feeling for the viewer. It is usually more satisfying to arrange things so that there are clear dominants and subsidiaries arranged in a somewhat graded series with respect to one another, no matter how large or small the scale of your picture may be. You will often want to break horizontal sweeps, but without creating too many primary focal places in any one view. Subsidiary forms are just as important as the primary ones. It is the relationships between the dominants and subsidiaries that you need to thoughtfully establish. All forms and sizes can have important roles in landscape composition. It may help you to think of how a natural woodland edge is organised. The use of the light available results in plants of descending heights coming out to the margins. When we imitate nature somewhat for our own landscapes, we are benefiting from eons of experiments the plants have done amongst themselves. What we see recurring in nature can feel right when we bring some of that vision home to a similar ecotome. There are helpful Universal Guidelines that you can seek out in matters like proportions which please most everyone, or ways to achieve balance and harmony in different aspects of your work, and I will also talk about such things in future articles. A vista needs a place from which to enjoy it. Insert a “place to be” by putting some seating there. The Emperors of China made many special ‘places to be’ within the land contained in the “Forbidden City”, where they and their families were destined to spend so much of their lives. Many of them became very personally involved in the creation of the landscapes and gardens within those walls. Contained in the Quianlong Emperor’s gardens of the Palace of Tranquility and Longevity is a special building from the late 1700’s called the “Belvedere of Viewing Achievements”. It was designed as a place dedicated to viewing and reflecting on all that was created in the landscape and on the achievements of their lives and those of their predecessors. I would wish everyone such a Belvedere. Even a small one is good, a chair in a just right place. When you have spent time making your landscape, you too will have earned your views, so think about siting your best viewing locations right along with the views you will create. There should be a focus from any usual place of viewing. Where will you wandering most often? You will want your compositions to be particularly satisfying from the places you will experience frequently in your daily views and meanderings. The scale of the compositions that matter in a location will depend upon the distance of the viewer to the view. A picture seen typically from a certain distance should be made in a scale that will be most effective at that distance. In close up places such as the foreground edges of planted beds or near your steps and paths, you will probably want things that are pleasing close up most all of the time. Basically, in the places you walk close to, things you choose should become more beautiful as you approach. There are certain ‘Sunday Best’ plants for the front row category, you just want to be choosy. Thoughtfully combined tree and shrub shapes or wonderful plants with large, coarse or short lived foliage can perhaps be most satisfying when seen from further away. 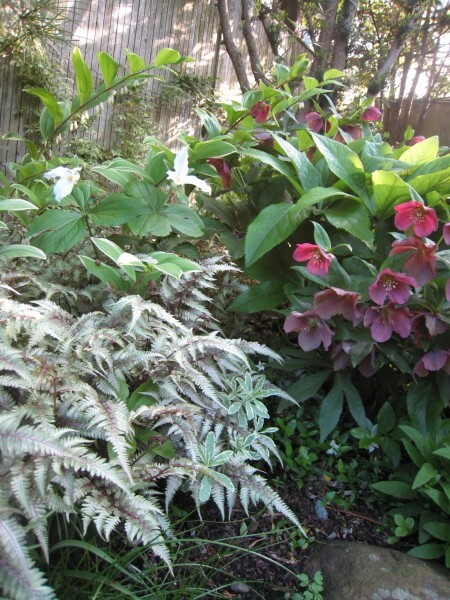 The attributes you cherish about them may be best shown at a distance, where modest character flaws, gangly legs or disappearing leaves can be masked by chosen plant associations in larger, layered plantings. Ephemeral plants you treasure can flower and disappear into populations of overspreading bed fellows whose good appearance will continue through the subsequent part of the year. Wherever you have a nice view, whether technically what you see belongs to you or not, you will want to flatter that view and be careful not to compete with it or obscure it. 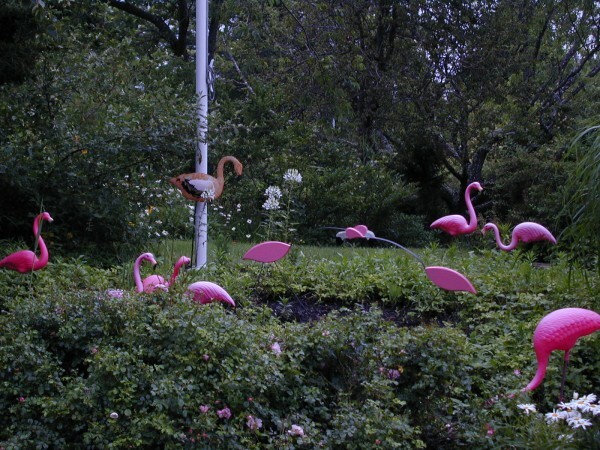 If you had a real Flamingo distracting you it might be all right, but generally you wouldn’t want your planted composition or sculpture to try to compete with an ocean or other handsome natural view. You can enhance such scenery by greening the edges. Everything seen together should look well together as a view. Usually the composition should allow you to see through to more distant desirable views, except where you are after an enclosure or surprise effect. When layering your landscape pictures, check carefully about the mature heights, breadths and textures of fore and mid-ground materials. It is unfortunate that there are many mistakes in the attributed size classifications of particular kinds of plants, especially if the plant has been introduced in the last 20 years. Dwarf plants are slow growing, but when they are introduced, still too new to anticipate the mature sizes, yet sometimes guesstimates get into the literature and onto plant tags. Most times, the plants will end up larger than predicted, sometimes substantially. Thus it may be best to check a few recent and authoritative sources, or better yet, find someone who has one growing. The corners of a property are key elements in the shaping of the enclosure of personal grounds. The interior triangles of land they naturally form often become important focal places and key planting areas. Their careful shaping will suggest the forms of the places in between. Create corners with your fences or background plantings. If you don’t make a two sided corner, the fence or boundary planting may read visually as an unfinished straight line in space. In doing this, you will create interior triangular enclosures, focal ‘triangles’ where you can readily insert multiple layers of plant materials, and later, curves on the inward facing borders of your place. For multilayered plantings, such triangular spaces are often much easier to organize compositionally than strictly linear beds. This is a cardinal rule in planning. If a kind of plant or anything else diminishes the beauty of a particular place just when other plants and most everything is lovely nearby, best re-site the detractor. Whatever looks dead or messy when the things around it look good should probably go elsewhere. If it is a good plant in other ways, you can probably find it a place where it will be more enhancing, in a scene more suited to its annual time of beauty. 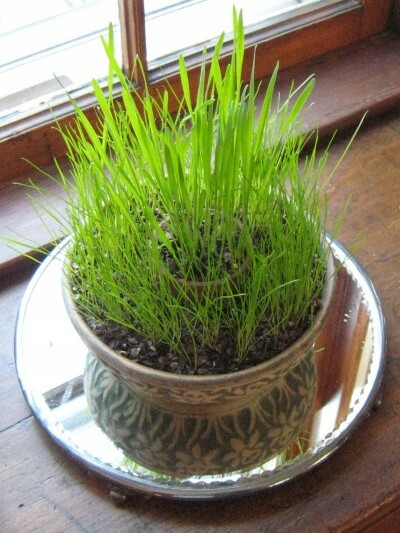 You won’t want something that doesn’t green up in springtime nearby your lush early spring foliage and flowers. Hibiscus syriacus, for instance, is so late to leaf out that it inevitably causes people to worry whether theirs is alive or not. It will probably look great in August, if you chose a hardy variety. Similarly, if you have ornamental onions such as A. Globemaster or A. Mars, their leaves will turn brown before their fabulous flowering time, so you will want to put them where their leaves will be automatically covered by bedmates. Plant evergreens in front of the bare deciduous things. For the sake of the green compositions in your winter views, deciduous woody things with messy sorts of habits may be better sited quietly behind, beside or above your better shaped and evergreen things. This way there is nothing unlovely in between you and your winter assets. Bank the beds whenever possible, to keep the maximum in the view. who tilt or bank their creations so details can more readily be seen. Similarly, creating garden beds with a gentle pitch from the back to the front will help the plants contained to show well. In the landscape, the embanking angle usually needs to be shallow to be sustainable in relation to erosion. 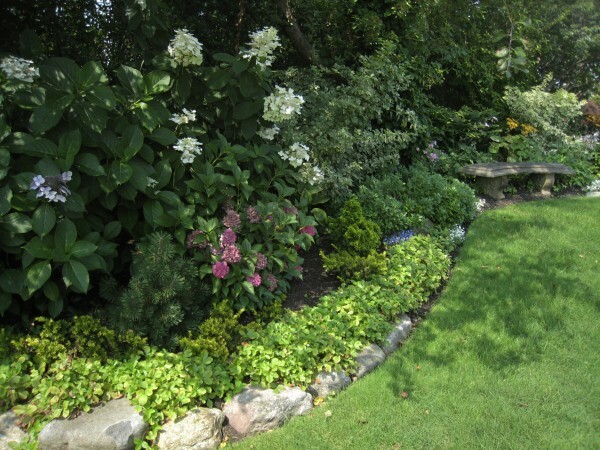 If it happens to be too steep where you want to plant, a bit of contour terracing or rock support may be helpful. To accomplish an embankment easily, look for places on your property which are masonry materials, “back support” for raising some earth up against to grow your plants at a slight angle. Unattractive masonry foundations, steps and corners can be softened in this way. Consider a grade change in your land form. Grade changes often lead to a feeling of increased space overall, making each part of the scene distinct. A raised bed can also lead to a greater intimacy in the experience you have of your plants and earth materials by bringing them closer to you and making them inviting to touch. Adding edge stones can help make a raised place safer in relation to paws, feet and corded edge trimmers. A line of handsome large-ish single stones well laid can be support enough for such a purpose, acting like a low stone wall. If an area is too steep for good planting, raising the edge may allow you to create a more level planting place, less susceptable to erosion. This is surely more handsome and enduring than the wooden perimeters often used to make ‘raised beds’. 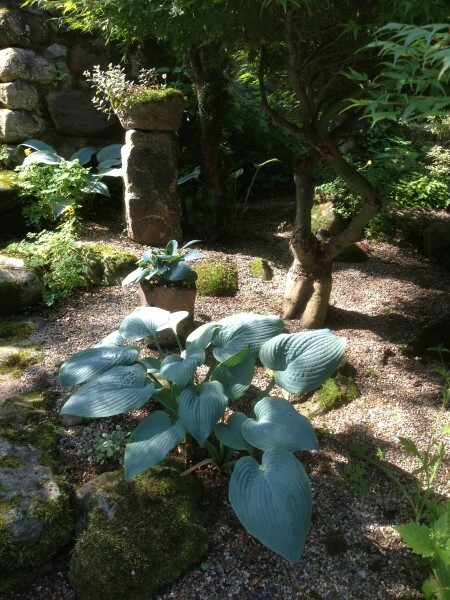 The curves of the plant shapes themselves can allow a banked presentation to the view. A similar principle is shown in the designed layering of your chosen plants with decreased heights from back to front. Nature tends to accomplish this on its own in typical woodland margins. Plants of different characteristic heights occupy all the possible ‘altitude’ niches there and, so layered, can share the light of the edge space. By consciously arranging things this way with your plantings you can increase the diversity of plant materials in your views. allowing photos of my work in their landscapes to be used on this site. Choose a Family of Stone and Hard Materials from the Beginning. It will save alot of problems if you considerately select the set of stone and hard materials you will be using together for your ‘palette’ before you begin to design your projects in any detail. You are after a sort of family of materials, a set that looks well together. Your early choices may strongly influence the overall appearance of your landscape because the initial selections will often establish the kinds that you will be using in subsequent work for the sake of continuity within your place. In terms of the quality of finished appearance, the difference between your hard materials options may be priceless, so you will want to look around and have an opportunity to choose. The materials you select will affect the cost, the ground preparation needed, the sequence of the work and the maintenance afterwards. Each particular kind of hard material has a typical shape, color and texture range, and other inherent characteristics which make it suitable for some building applications and not others. For this reason, for the different uses you will need to choose multiple kinds of stone and hard materials. Some will be best thin, others thick. Some will be large forms, but the small forms of the same kind of stone can be used in other applications for a overall natural appearance. Once you have thought about your necessary uses, you can choose your ‘family’ of specific building materials from those that are well suited to their jobs. The enduring materials such as wood, stone, concrete, metal, asphalt and even plastics that you choose are fundamental in establishing an esthetic connectedness for your property. = You need to look at (absolutely) everything. From the advice of Italian Master Mason, Carmelo Messina. Get the best materials you can afford. Durability is an issue. Materials that seem a bit more expensive may actually be a far better buy because their lifetime in the landscape is a lot longer. 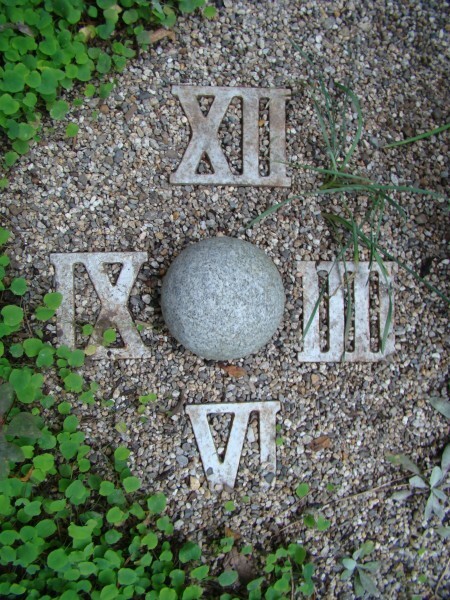 Time goes by quickly in a garden setting, and you won’t want to replace things just when the plant materials are maturing nicely. Or ever, preferably. If you do things right the first time, and quality stone is your medium, the work will last. Sometimes the handsomest and best overall materials may even cost less than alternatives if the source is nearby. “Oh thou sculptor, painter, poet! You may want to choose the very best and most long lived kinds where the floor is busiest and most visible. Consider the character of the various stone and other materials already in the view. Whatever you choose to bring in should be harmonious with existing elements that you like and are keeping. If the family of materials you build with originally came out of the same area as you reside in, or from similar geological earth areas, when you build them in they can seem as if they had always been there.The chosen set of materials may be more pleasing if it seems an appropriate part of the local landscape in general. If you are choosing between alternative materials, consider how their color and character will work in relation to whatever else is already on your property, in the views or in scenes nearby your home. There are so very many kinds of stone, each with their own character. Their appearance depends on which place they come from, the geological history of that location and how long they have been out of the earth and in the weather. If you use the same or related kinds of materials for all similar applications throughout your property, such as all the steps (or all the paths or all the stone walls) being a particular kind of material, that consistency will help create a unified feeling and esthetic within the place. You can use particular kinds from your set of materials in the same way in your various locations. Materials with durable flat surfaces will be good choices for the horizontal work created, such as treads of steps, paths or terraces. These can be just a couple of inches thick. You can be equally consistent for vertical applications, but you probably need a different kind of material.…. Three dimensional kinds of hard materials are probably needed. You often need small, medium and large versions of the dimensional kinds of stone you choose. If they come from the same bedrock, they will usually look well together. Size classes roughly like Corn kernels, Marbles, Golf balls, baseballs, and soccer balls each have different jobs. You may need a small kind allowing good drainage in some areas. If this small material is taken out of the same geological location as the larger stone you are using, the color set can provide consistency. 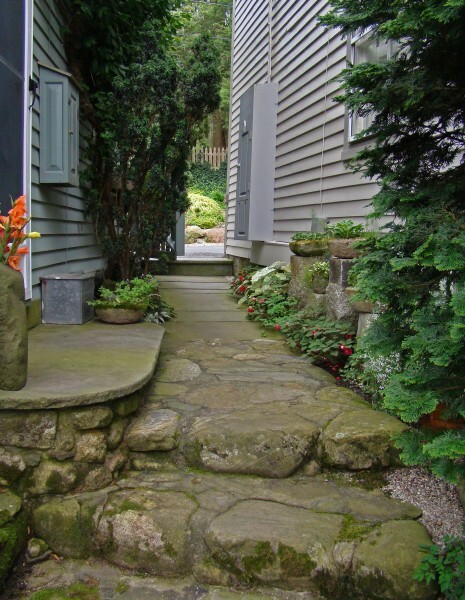 Your gravel or crushed stone may be visible in walkways, drives, surface drainage areas, or stone garden mulches. Gravel is a natural stone product, which is screened from the sand or earth matrix to obtain the desired sizes. Here the 1/2″, 3/8ths ” and 1/4 ” types are called peastone. You will need to be careful of what you buy as peastone. It is best to check the actual source pile since the color of the natural run of peastone may vary over time. 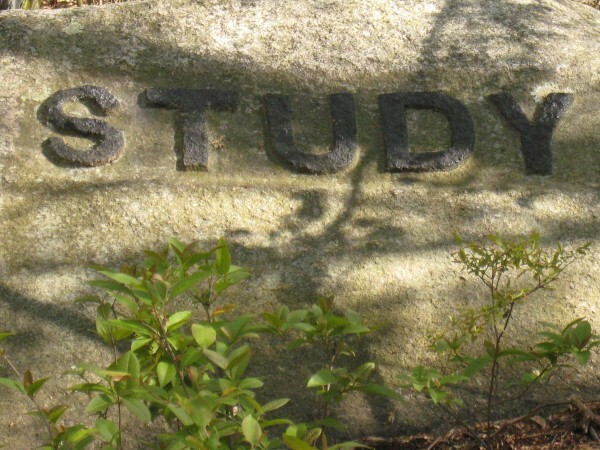 The stoneyard may change their source, so bring a sample of your own original material. 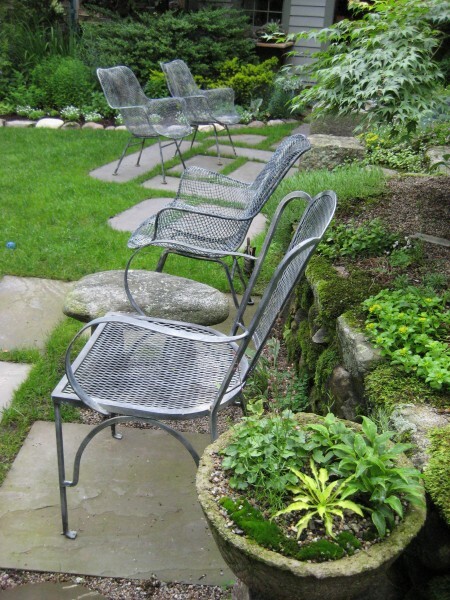 In addition, some distributors of peastone blend in crushed stone of the same size with the gravel, making the overall product have a sharp texture, which is less desirable for garden uses. Look around at nearby built work to find out what materials may suit your local esthetic and be available to you. A particular vernacular visual character is established by the kinds and colors of materials that have been commonly used in your area over a long span of time. Often this is because they have been available close by. Their character is part of your biogeographical destiny, an intrinsic part of the eco-esthetic nature of your place. There are choices that are a natural part of the local palette. What is beautiful in your eyes and locally available can help you determine the range of good choices for your projects. Go see nearby stone and hard materials suppliers, quarries and maybe even excavation and blasting projects that might be sources for you. To find suitable matching material, it will be important to travel with a few photos and physical samples of stone and materials in your car. These will speak volumes to knowledgeable masons, or the masonry and stone suppliers. Color and character are hard to describe in words. Truly local materials may or may not be available, so if what will be used must be brought in from other areas, your job may be to locate the best match for that typical local material. This will be especially important if you want to blend with some already in your home surroundings. Keep Track of Your Sources. Try to get kinds of stone and other hard materials that you will be able to get again, as this will be important for your future projects. Many of the most beautiful landscapes are made over some years. If you have found a source for any wonderful material, this may be treasure for your place down the lines of time. Keep track of where each of your chosen kinds came from, and find out how to request those particular types again. When you are engaged in making a landscape, you will be needing matching materials later, more likely than not. For stone constructs with visible cement or mortar joints, or if you mix stucco, the components of the mix matter for the outcome color. 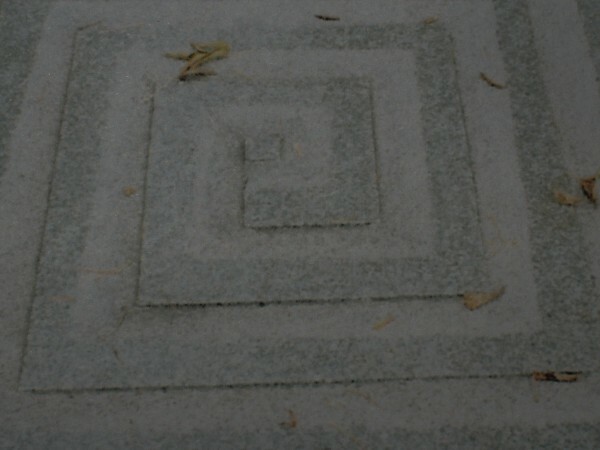 There are different mixes and various proportions used by different masons and this can affect the color. You will want to use the same recipes as are established on your property, so ask your builder or your sources how to specify them in future.If you make notes for your files at the time of the work, it saves a lot of time and trouble later, just as it does in your home when it is time for touchups and you kept track of the specific paint colors you used. Asphalt can have different textures and colors depending on the size, color and the proportions of sand and stone embedded in the matrix. The color of the bedrock that the small stone came from will determine the overall hue. 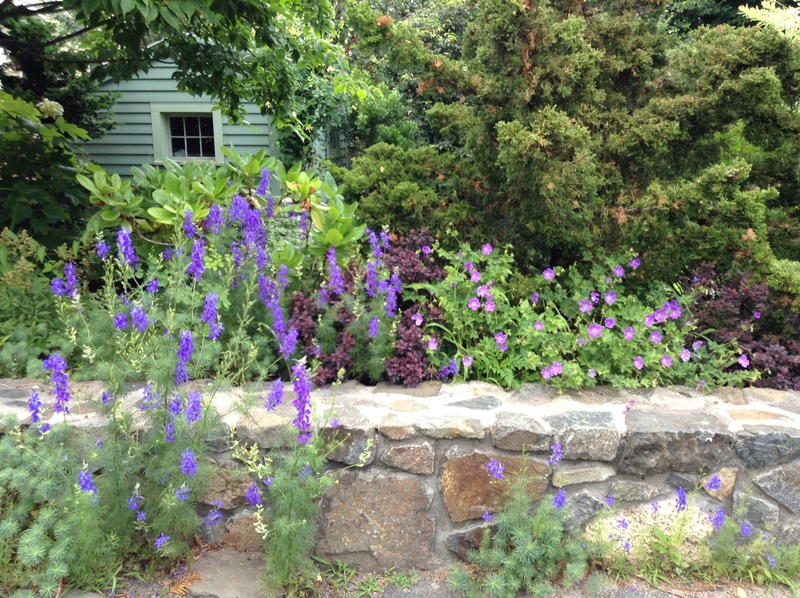 Nearby here, we see driveways with a decidedly purple caste due to the color of the bedrock in Saugus, Massachusetts. Elsewhere we see the range of tans and greys typical of the Cape Ann gravels embedded. Thus even when sourced locally, driveways made from materials from different quarries can have very different appearances, so where your contractor buys his asphalt, crushed stone or peastone matters. If later you need to add or patch with something resembling what you already have, it will be infinitely easier to succeed if you noted down the original source. Keep track of your Artisans. The hand of the particular mason or builder can be very important to the character of each built project, and to the appearance of the property overall. Consistency is most easily accomplished if you begin with an artisan whose work you love, and can who can probably come back over time for subsequent similar projects. If this is not possible, for continuity in your place, choose someone who can build in the established style. There are many kinds of masons. The ones you need will depend upon what type of masonry work you will be doing. Best to visit their work. by repeating or related parts…. Harvest Fair at the Hallockville Farm Museum on Long Island. This year the Quiltmaker’s Guild, the Basket Maker’s Guild, the Rug Maker’s Guild, the Herb Society, the Woodworker’s Alliance and other masterful craftspersons were represented. Members worked at their respective crafts all day, providing continuous demonstrations using antique and new tools. 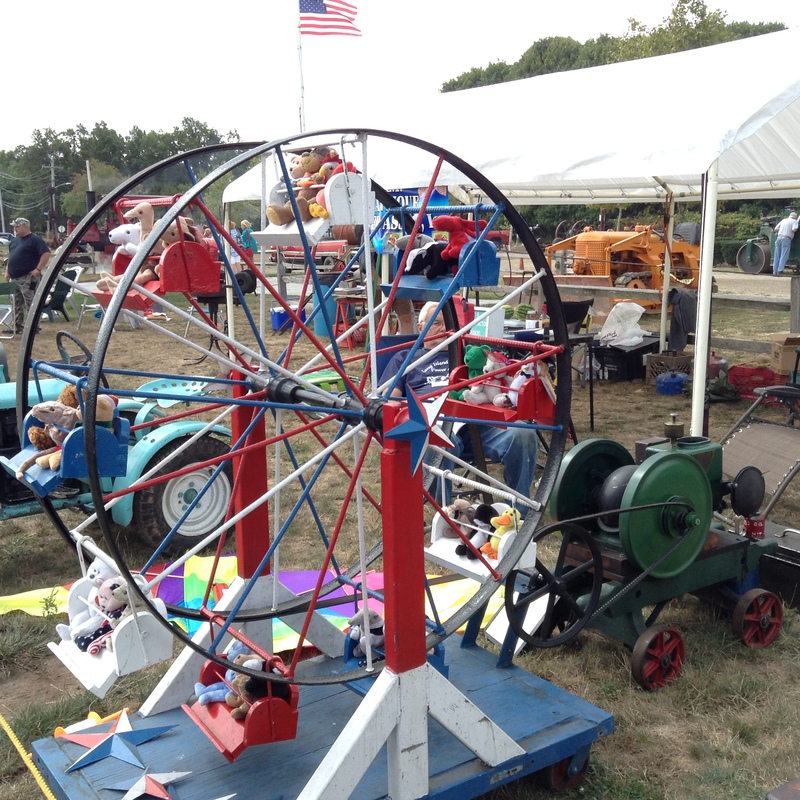 The members of the Antique Power Association are always present in good numbers, showing working examples of the antique and vintage machines that helped the Farmers of Long Island to flourish through the last centuries. 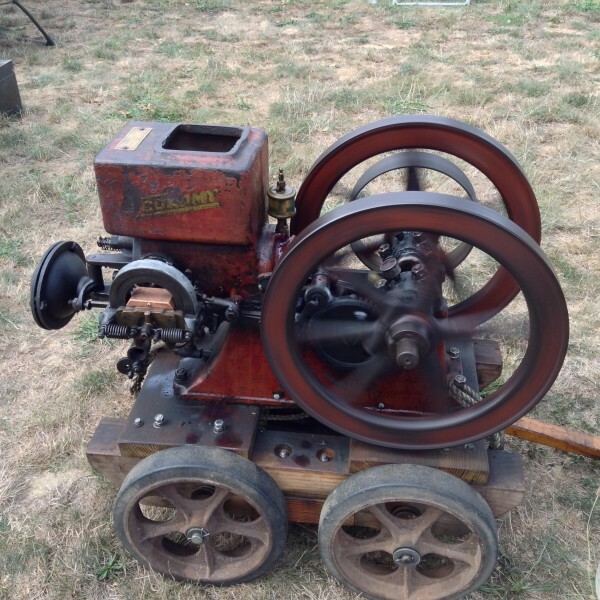 Their collection of Stationary Engines, Tractors, Mowers and other tried and true machines is organised for our better understanding how things worked, from back in the day through the sequence of innovative designs leading them into present forms. 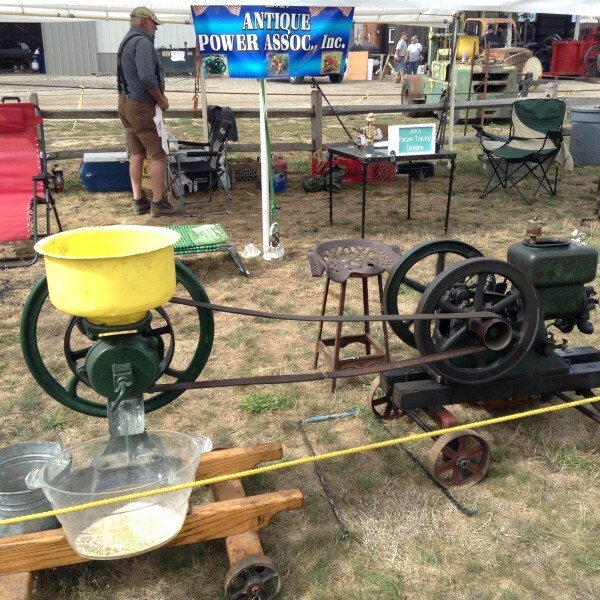 Many of the old machines wander around the Fairgrounds for this occasion. 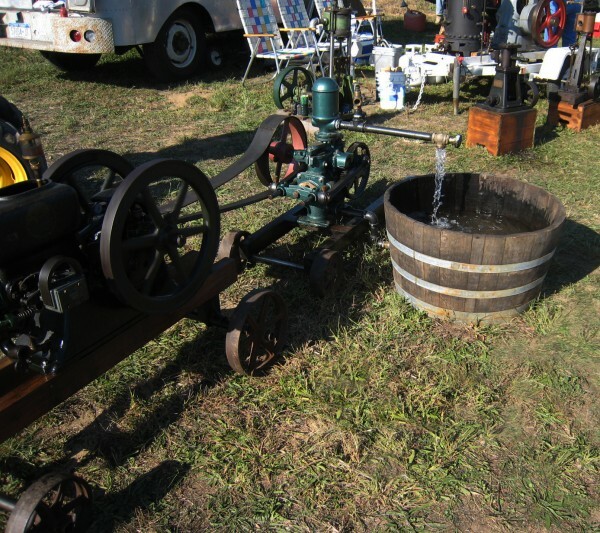 Much of the Homesteader’s work in the early 1900′s was done by a stationary engine, which could be put to many purposes on one’s farm. Here, with different attachments, this simple machine is shown pumping water, grinding corn, and running a small ferris wheel. This was the solution to the problem of a lost cork. 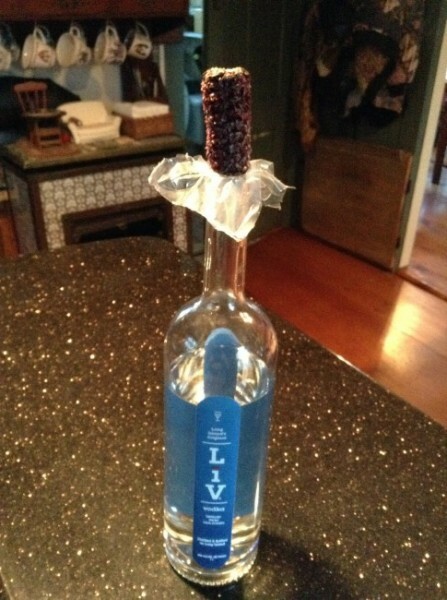 The cork had exploded off somewhere as I was driving around Long Island, which meant the Vodka was splashing out. I presented the matter to Nelson, a farmer at the Briermere Farms on Long Island, where I always stop off for beautiful Jams and Jellies. So Nelson said “wait a minute, I must have something”. He spun around, looking at all his vegetables, and a moment later he reached up to grab a decorative dried Indian corn, broke off the narrow end and stripped the kernels from it. He wrapped the point in a bit of plastic and twisted it in tightly. Sealed very well ! 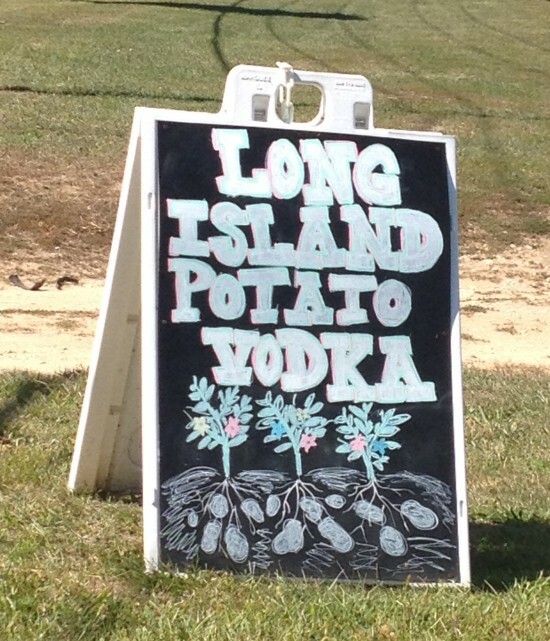 is created on a nearby farm, distilled from Long Island potatoes. It is definitely the finest Potato Vodka I have ever tasted. And then there was a Fleet of Giant Pumpkins……Suitable for small Cinderellas. The plants listed below were among those in bloom or looking great on our Open Garden Day. This list was very popular, so I thought I would provide it for those of you who could not be there or didn’t get things written down that you might have liked to. 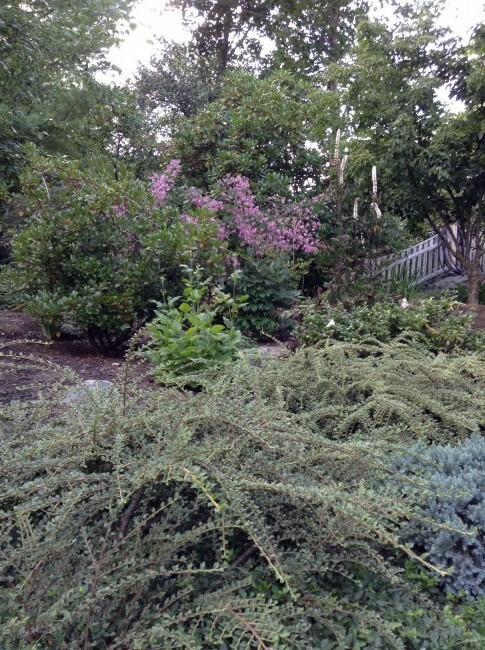 August 10th Garden Conservancy event………. from the Salem News, Marblehead Reporter and Boston Globe ! It was a perfect Open Garden day………..221 people contributed to the Conservancy, and with the children counted in, about 233 attended. …….One couldn’t ask for better attention than that…. The energy in the air was positively swirling around all of us and innumerable questions got answered……….. Precious was a two year old sniffing everything with her Mother’s help…and smiling each time, as we humans tend to do when experiencing garden intimacies. Our grownup smiles are often inner smiles, but she expressed herself so openly……..
And there was young girl who was crying because she had lost the ‘grass bracelet’ made in the previously visited garden…..so I gave her leafy strands of Myrtle Jekyll’s white, whereupon she made herself a crown and was fully consoled. I had a list of the plants in bloom hanging on the door to my shed / office in plastic, and that was covered with thumbprints, much better attended than the one with absolutely all the plants of 19 Circle Street. I will soon publish that shorter August 10th In Bloom list as a post on this Website. And so……….Thankyou Salem News ! 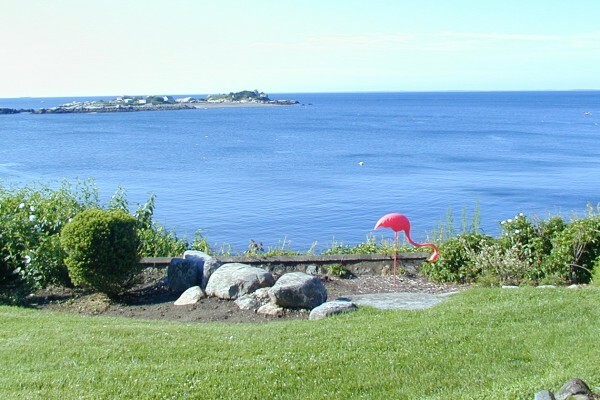 Top 10 Things to do in Marblehead ! And Thanks to the Boston Globe for including us in their unusual things to do that weekend. 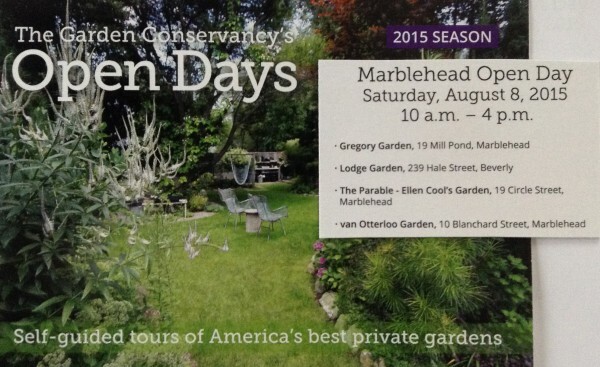 Sunday, August 10 | 10 a.m. to 4 p.m.
Visit four gardens in Marblehead, MA. in any order you like. Admission is $5 for each garden. Music in the Garden here ! We all hope to see you in our Gardens on this special day !